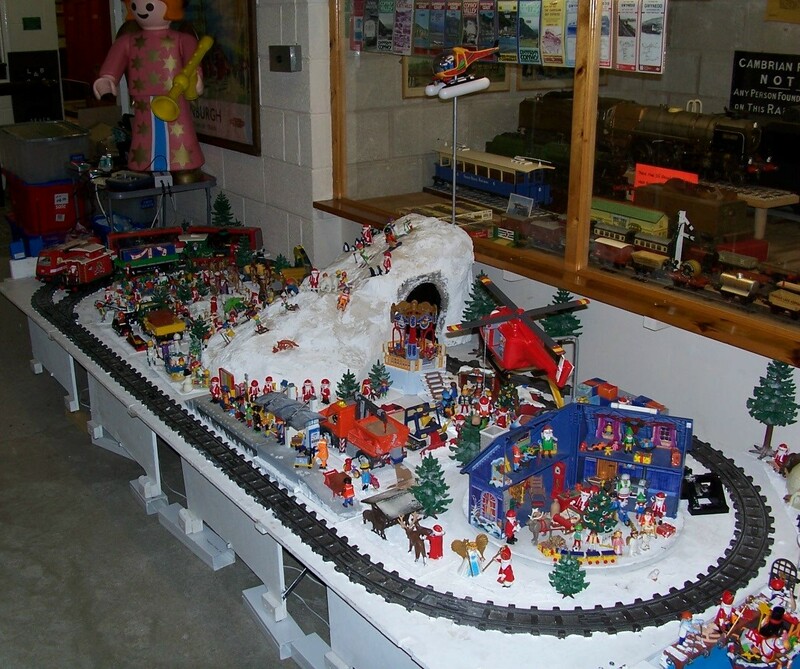 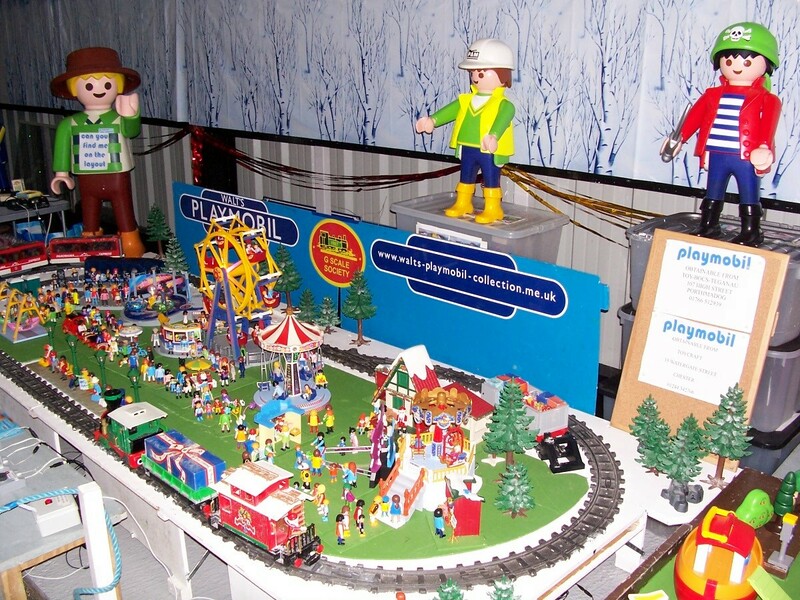 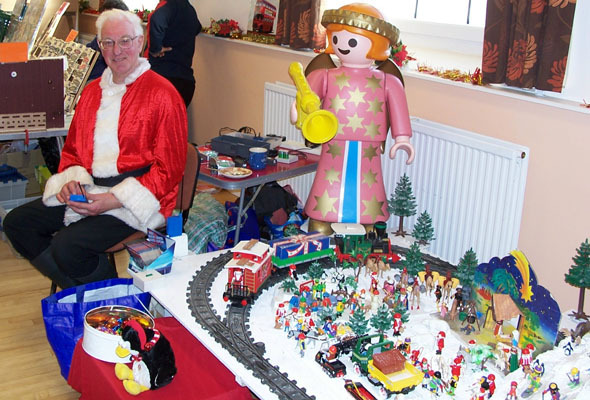 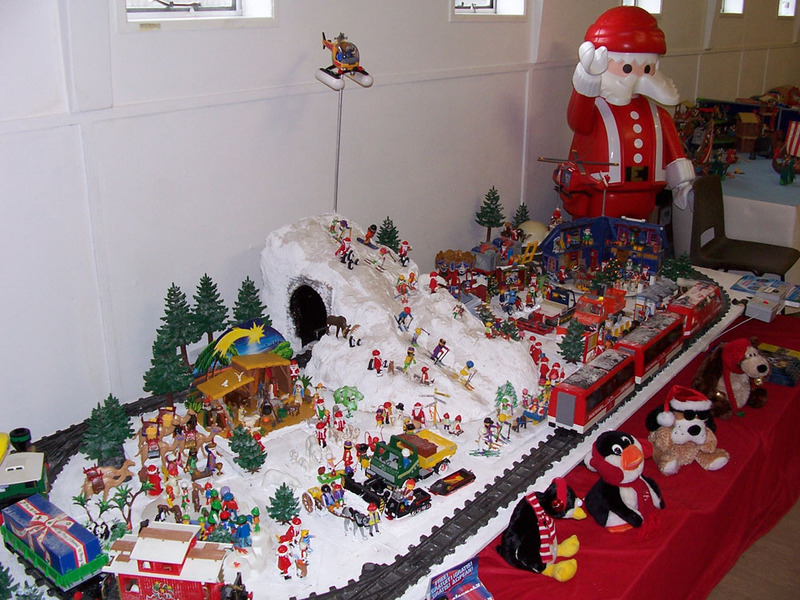 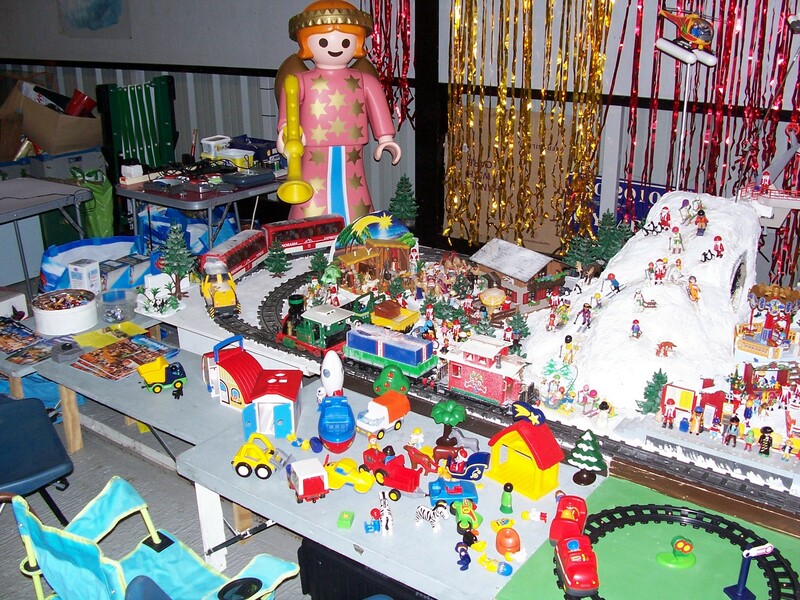 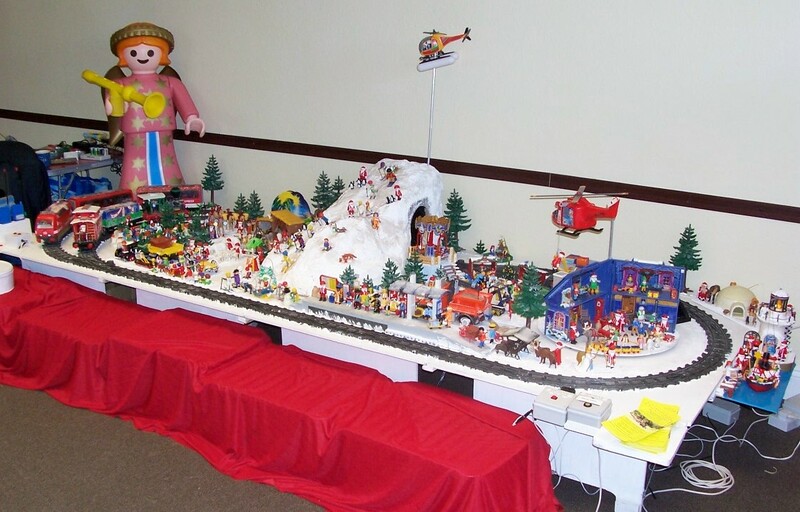 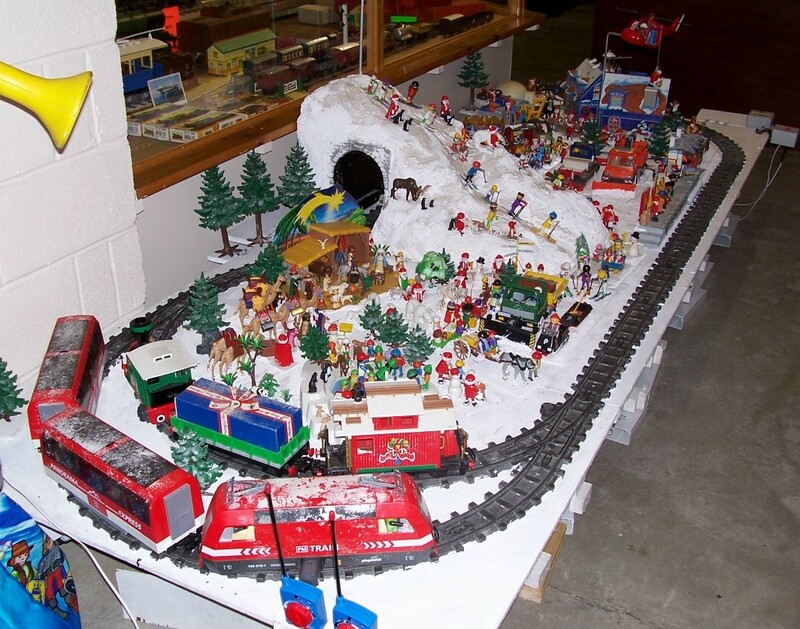 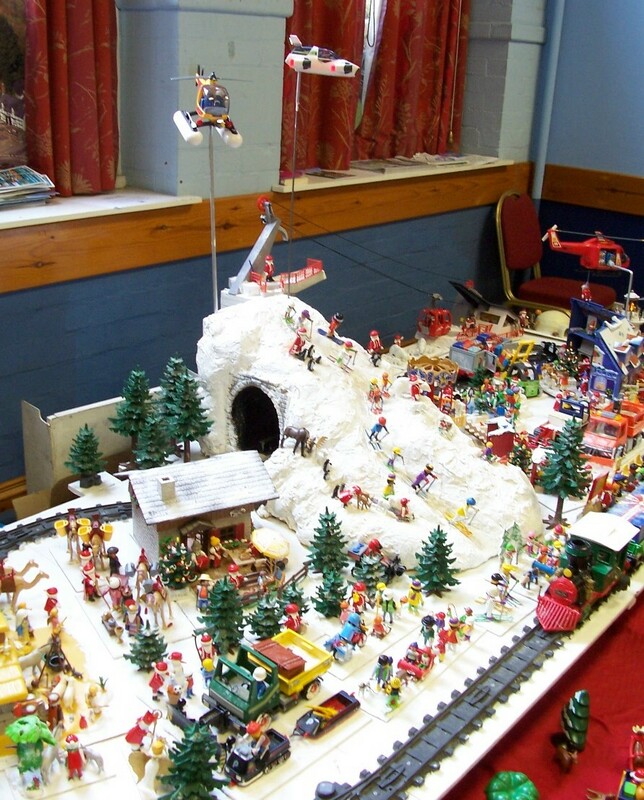 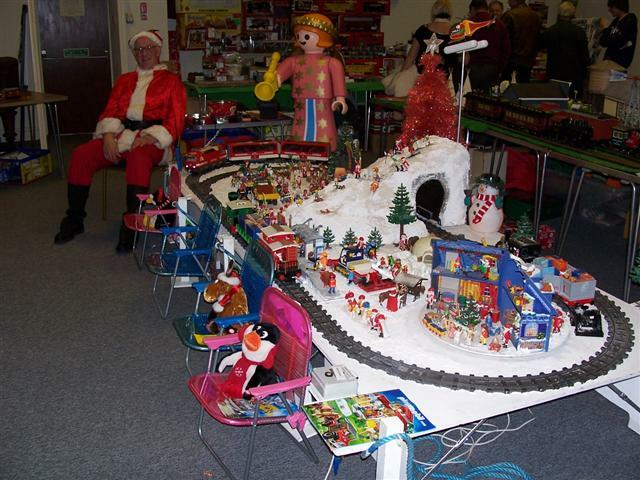 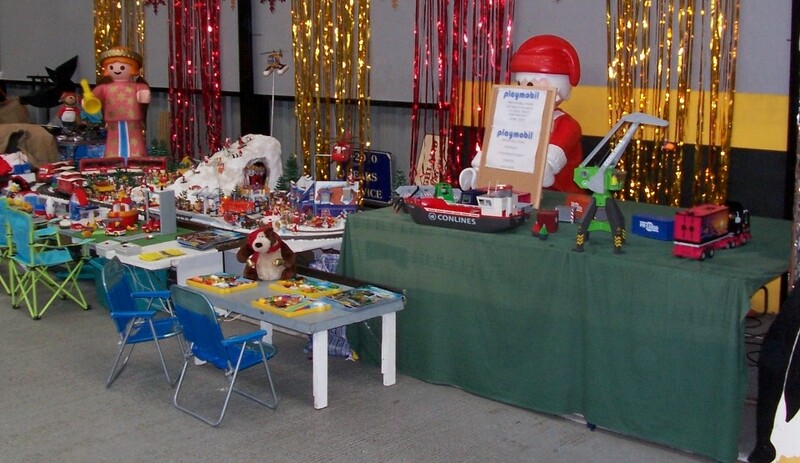 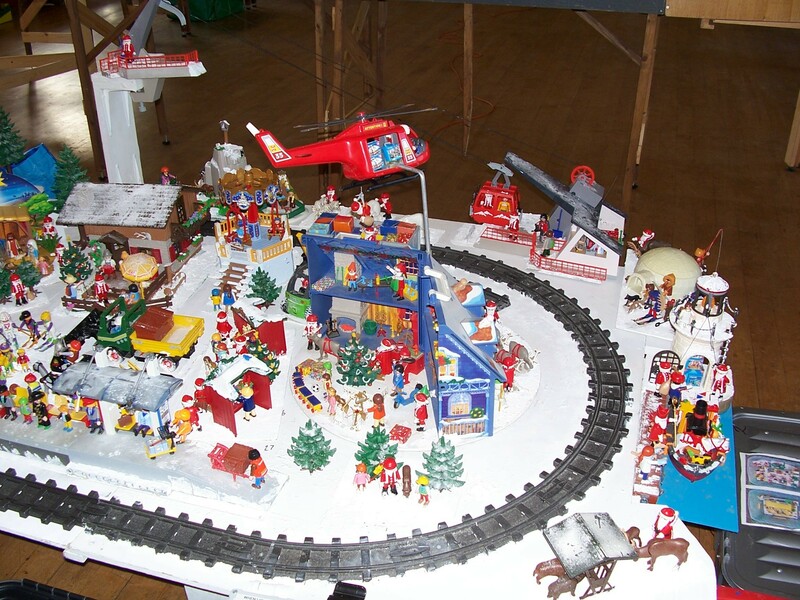 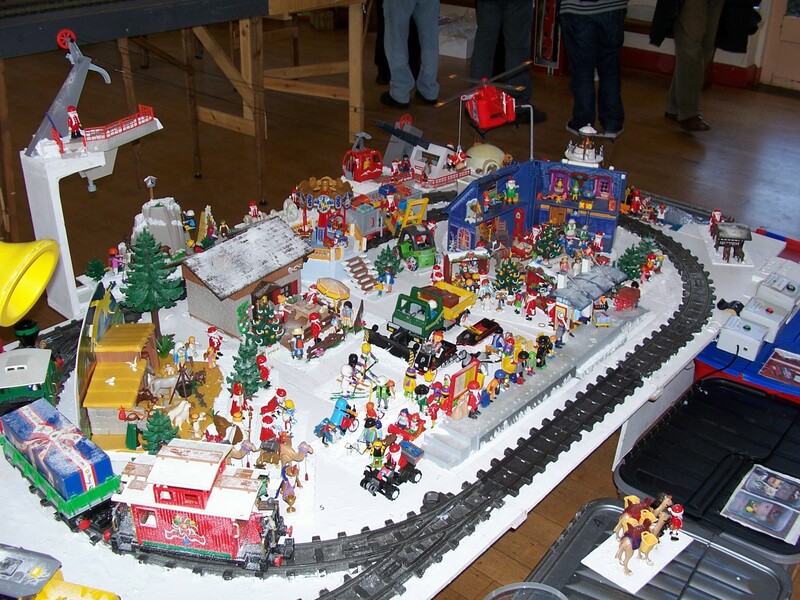 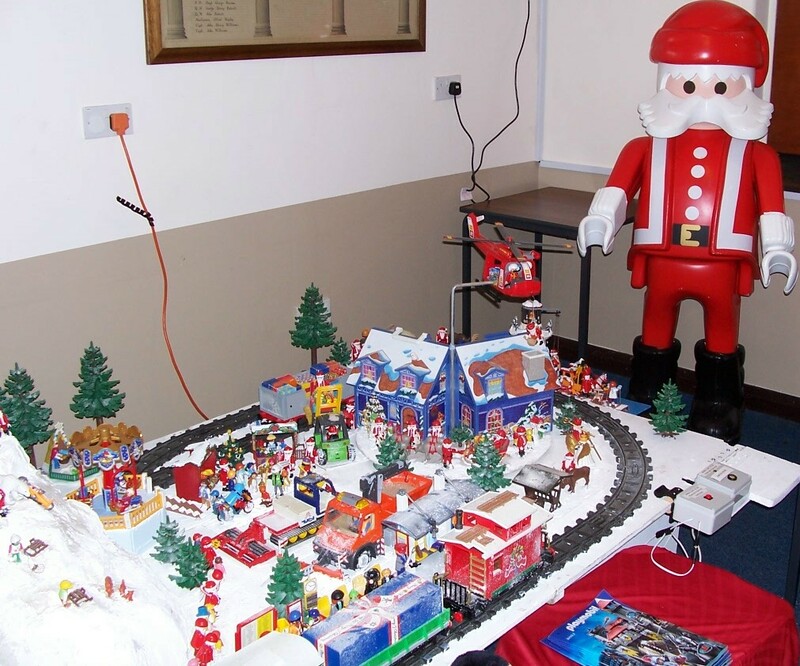 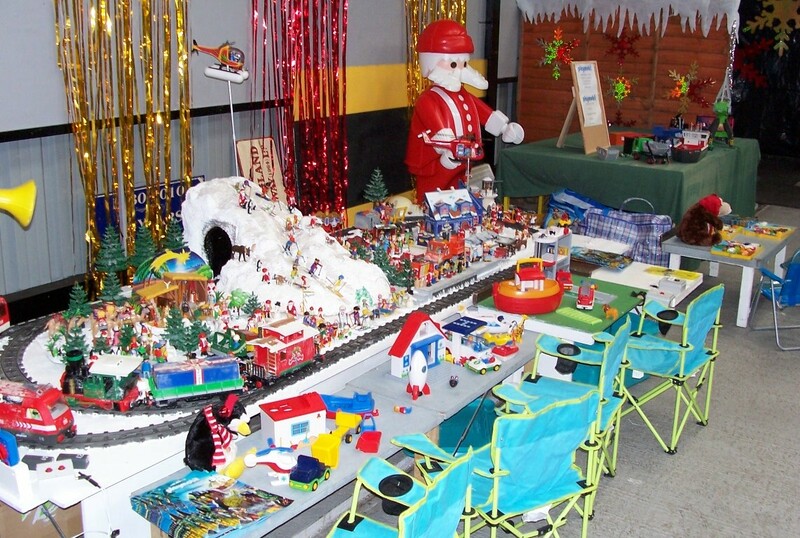 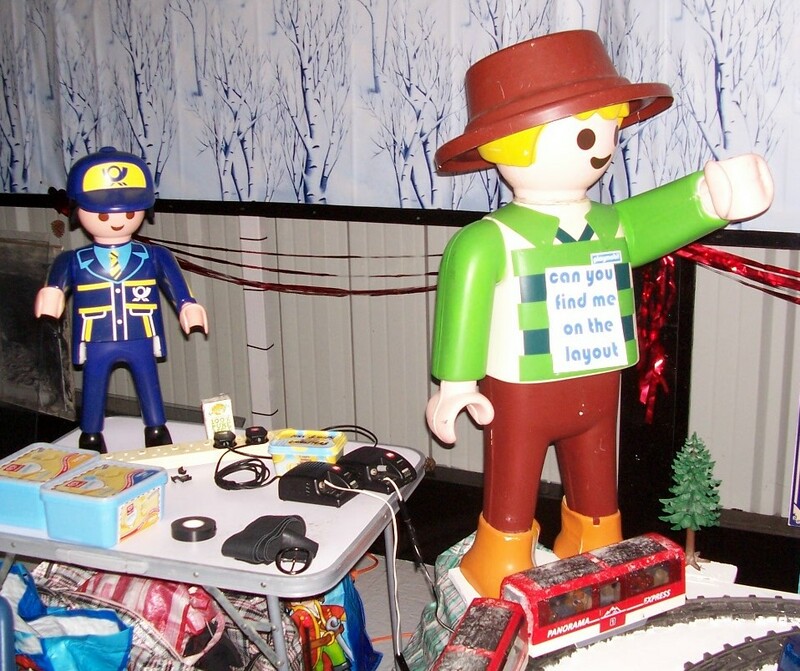 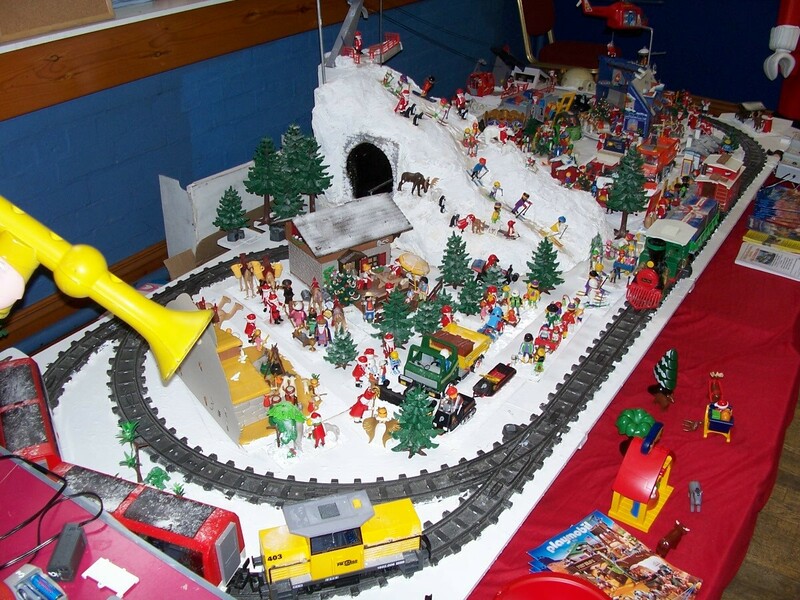 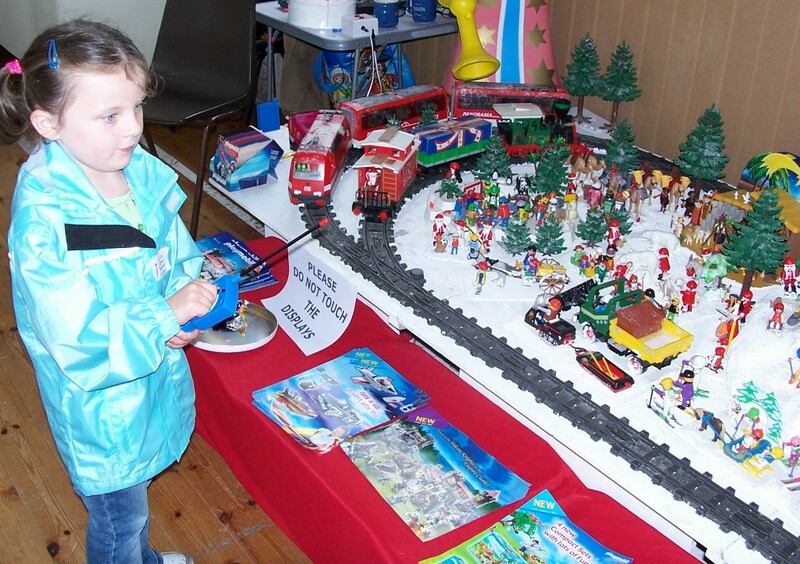 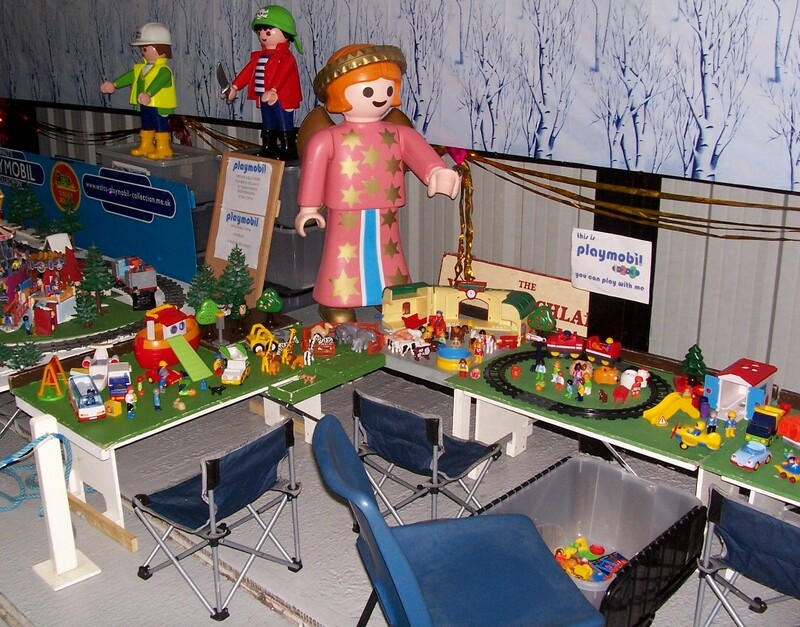 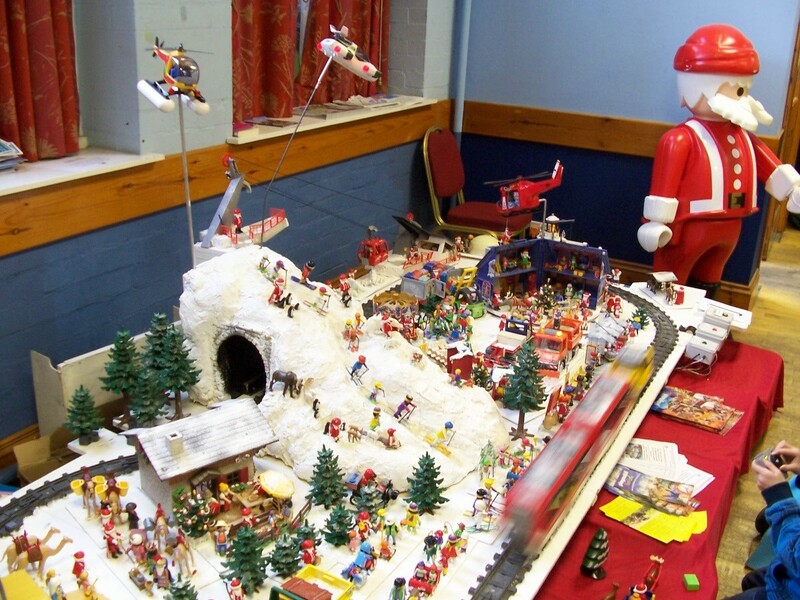 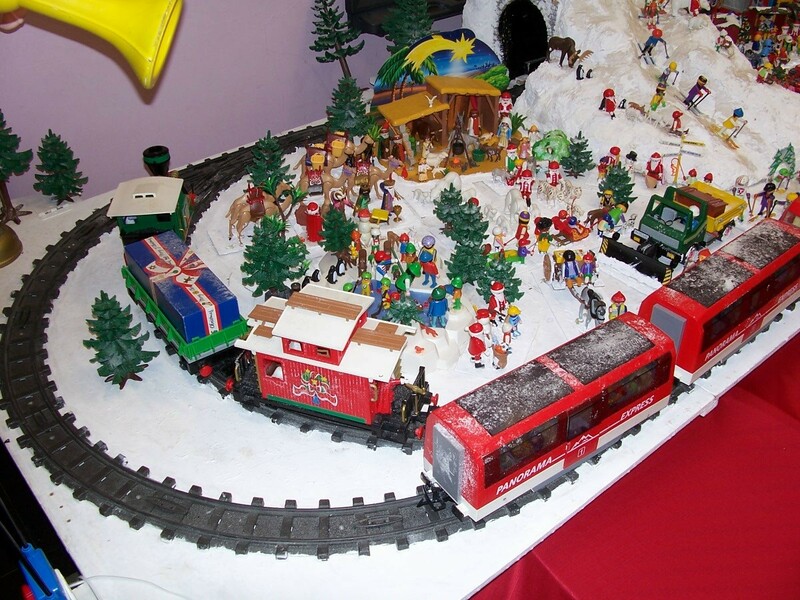 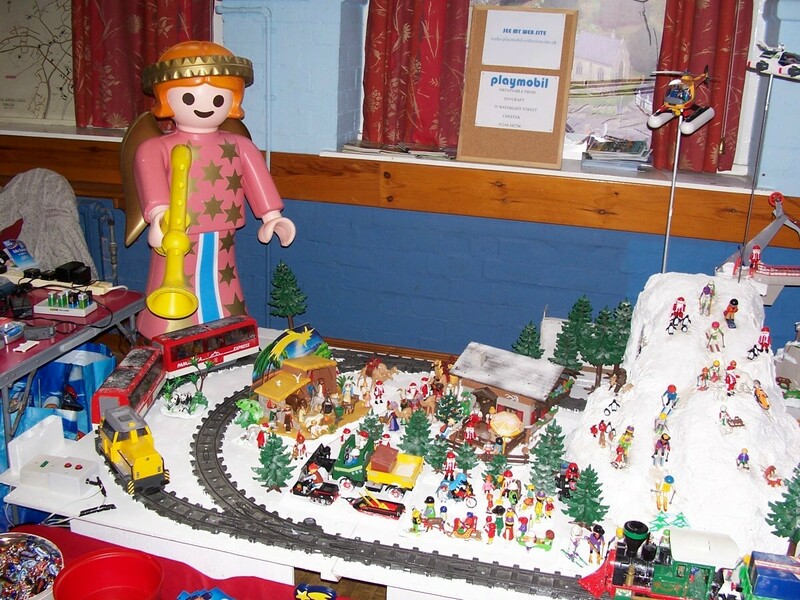 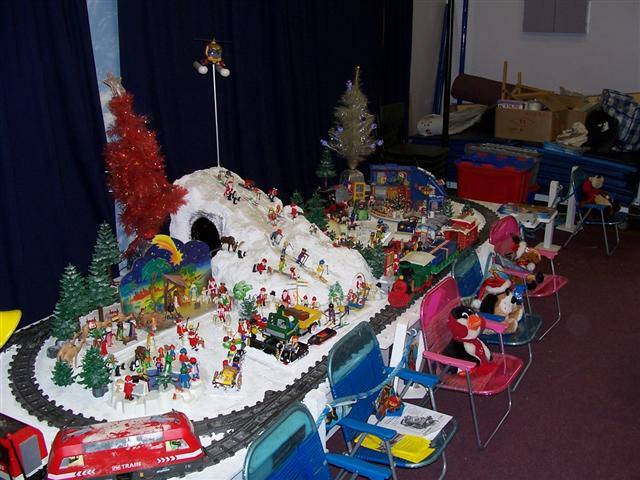 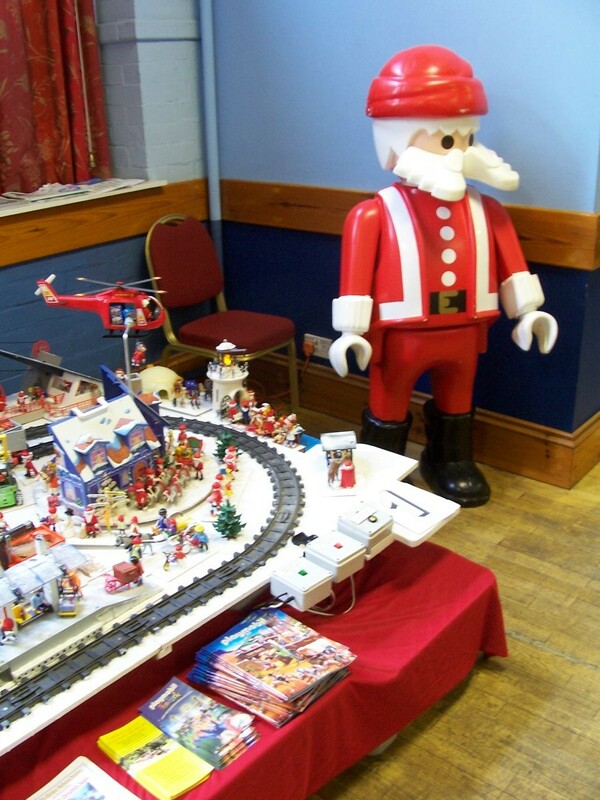 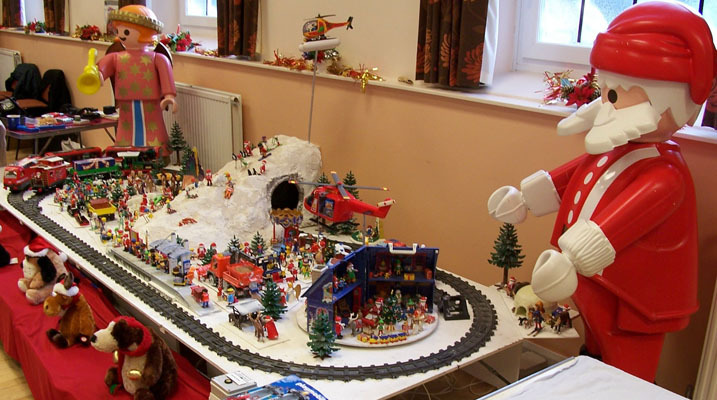 The Christmas Layout was started in 2005 as my wife had displayed her layout at G-Wizz-its Christmas Again in Lytham in December 2004 and said she would bring it again for December 2005. 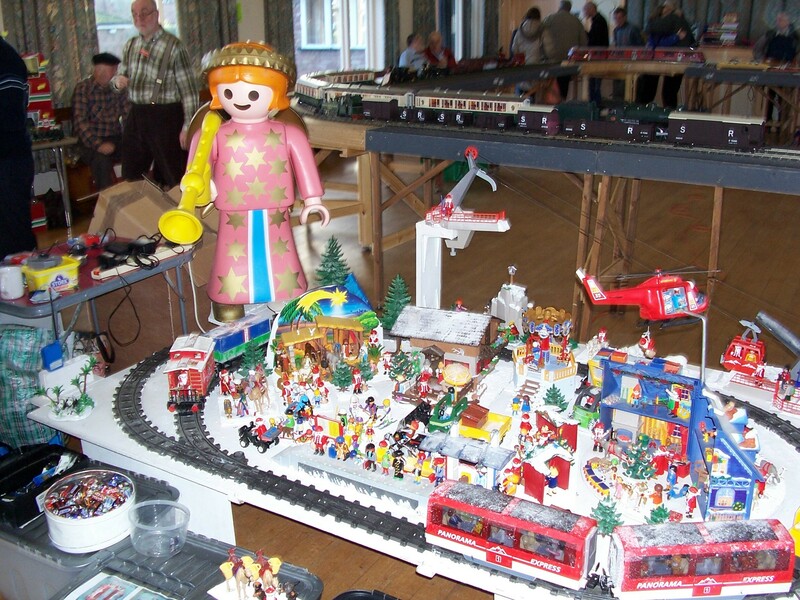 In May she was told at work that no staff could have weekends off in December. 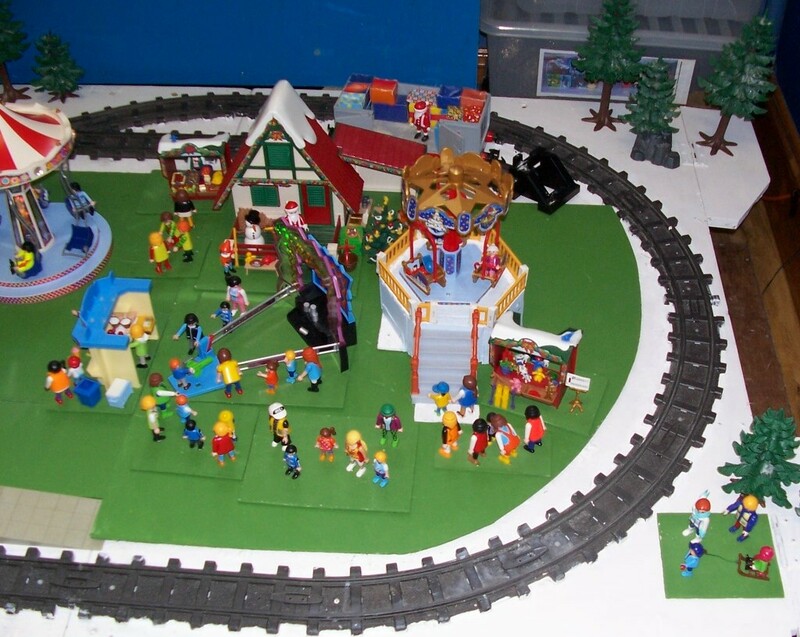 So I decided that I would build a layout taking up about the same space. 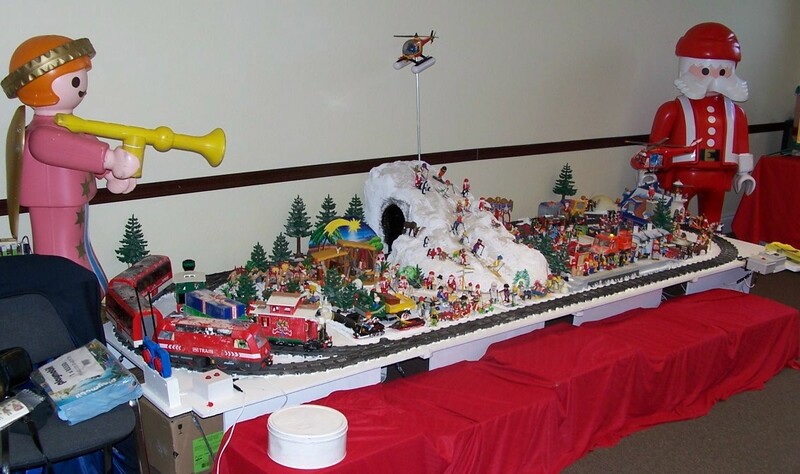 It would have to fit in my car with top box on and be able to be set up in two hours. 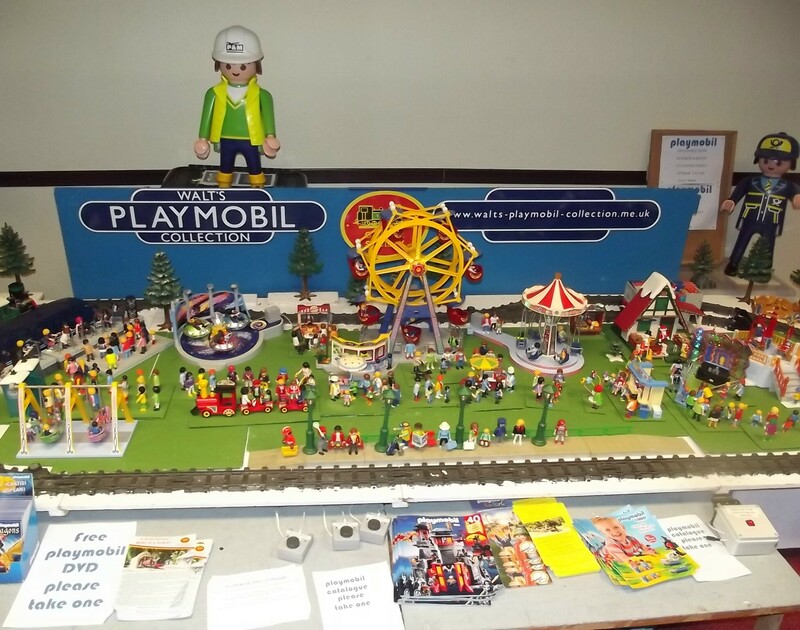 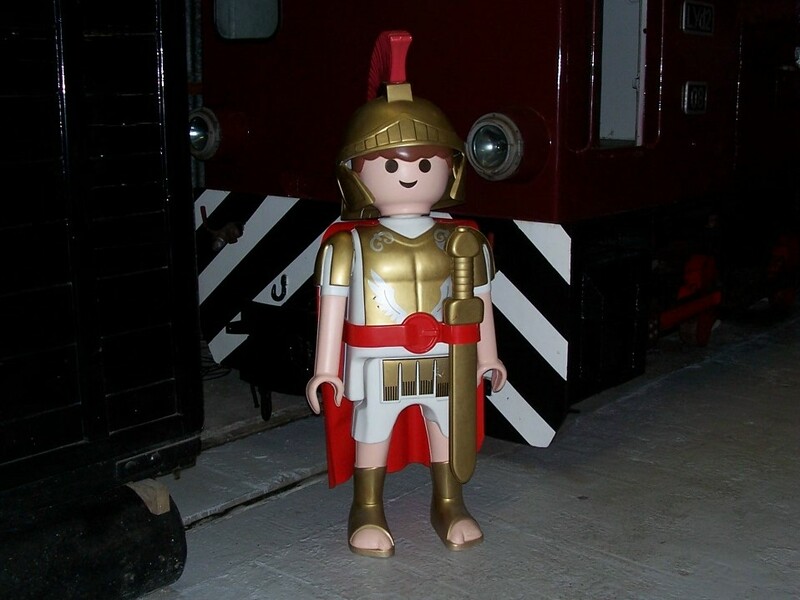 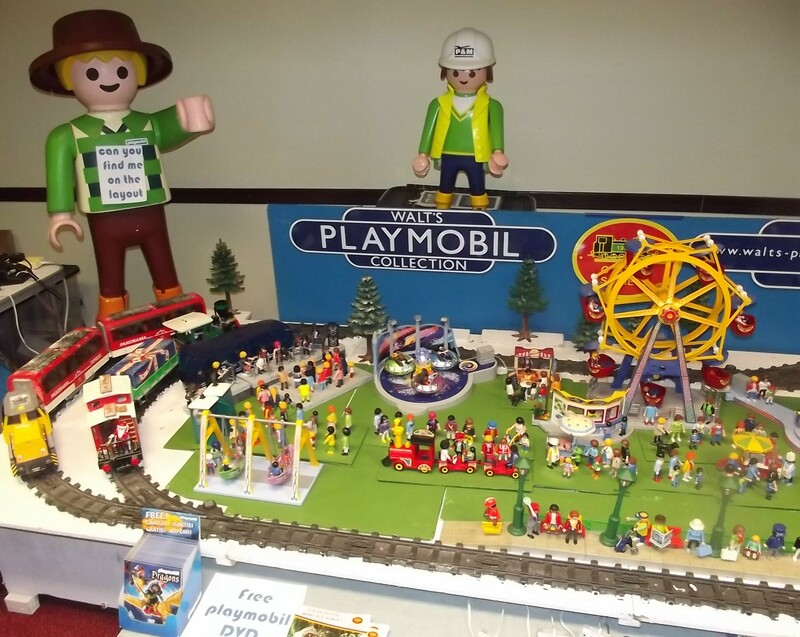 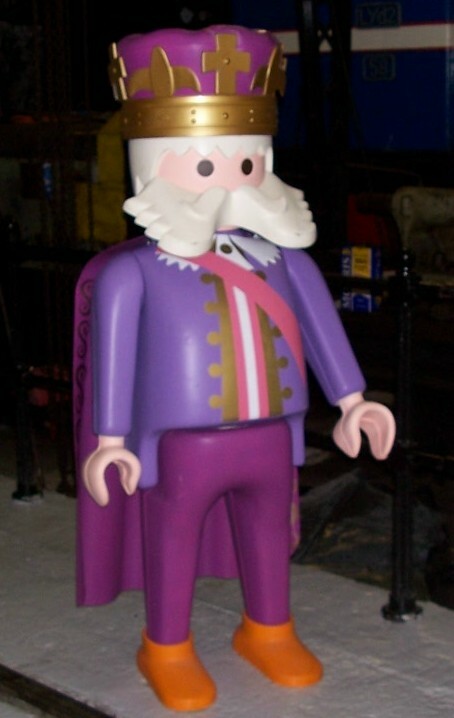 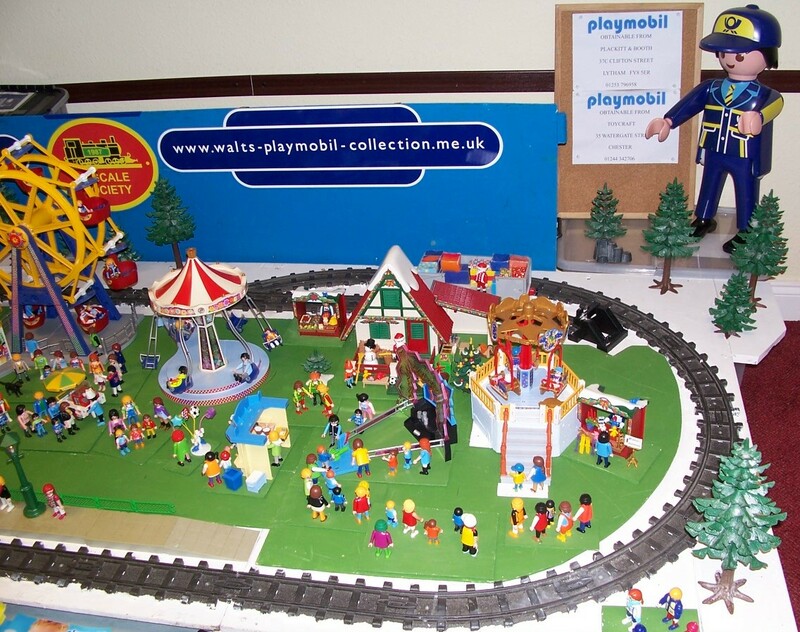 I would us the Playmobil R.C. 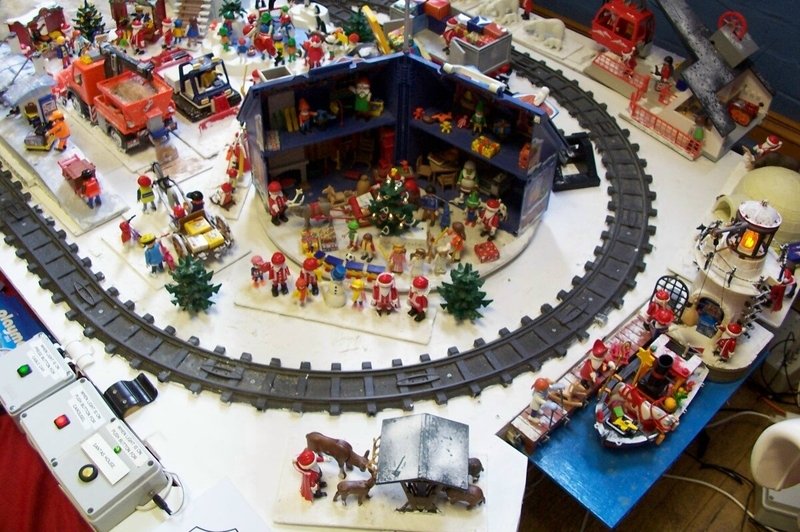 Christmas train and the new Red RC loco with two red coaches. 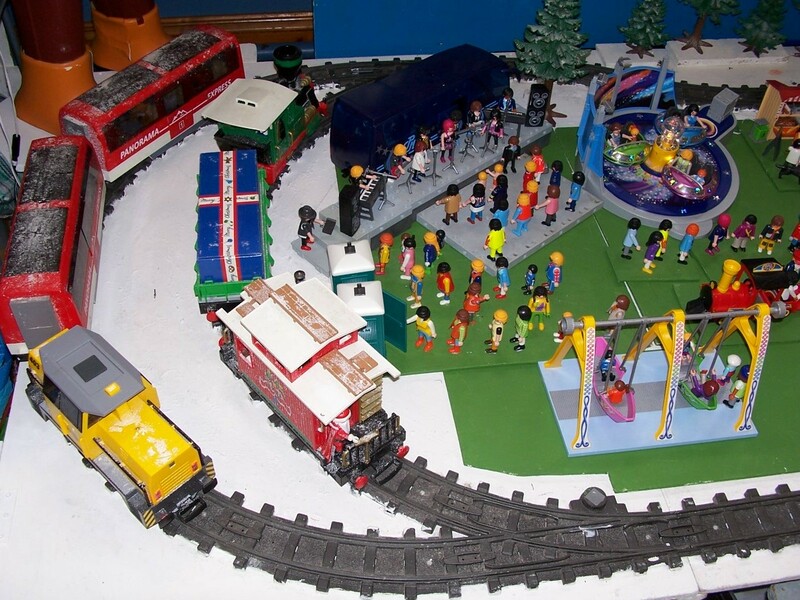 On the layout is an oval of track with a passing loop at one side and a siding. 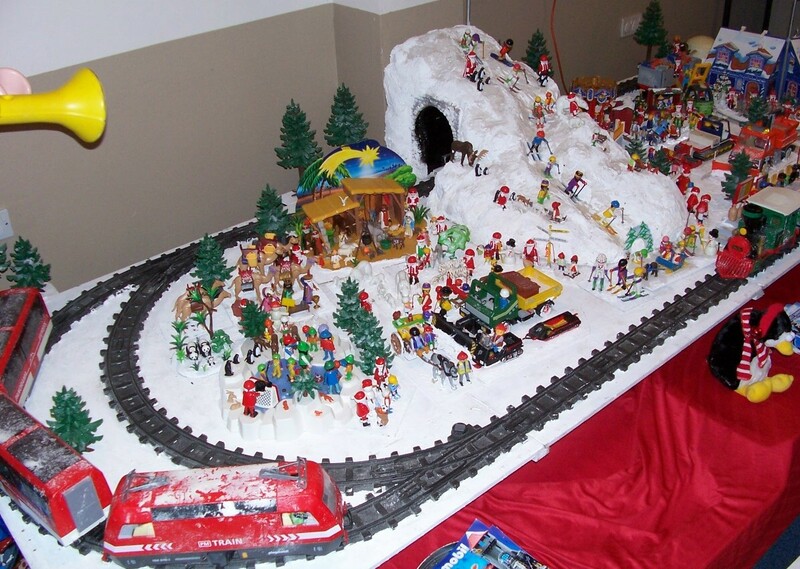 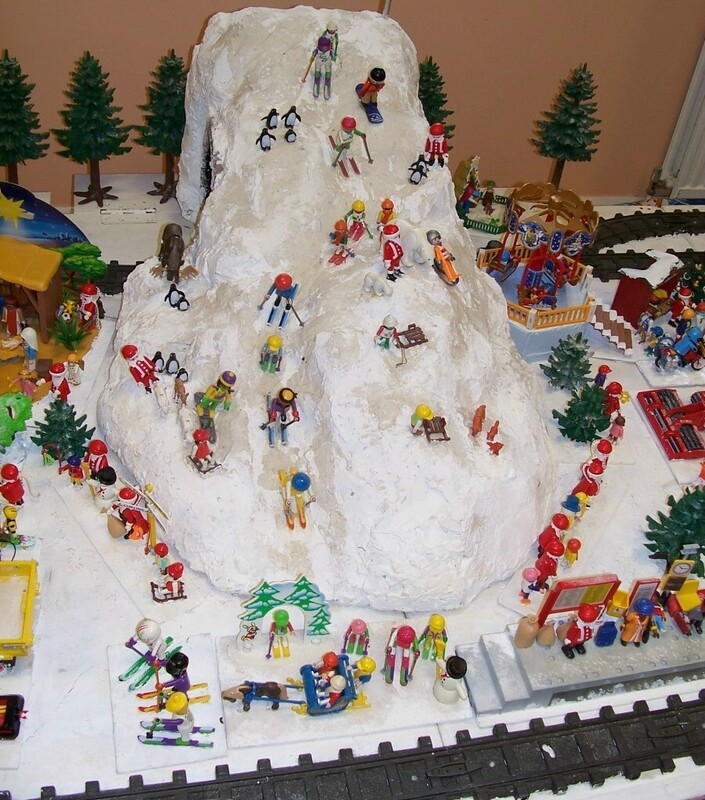 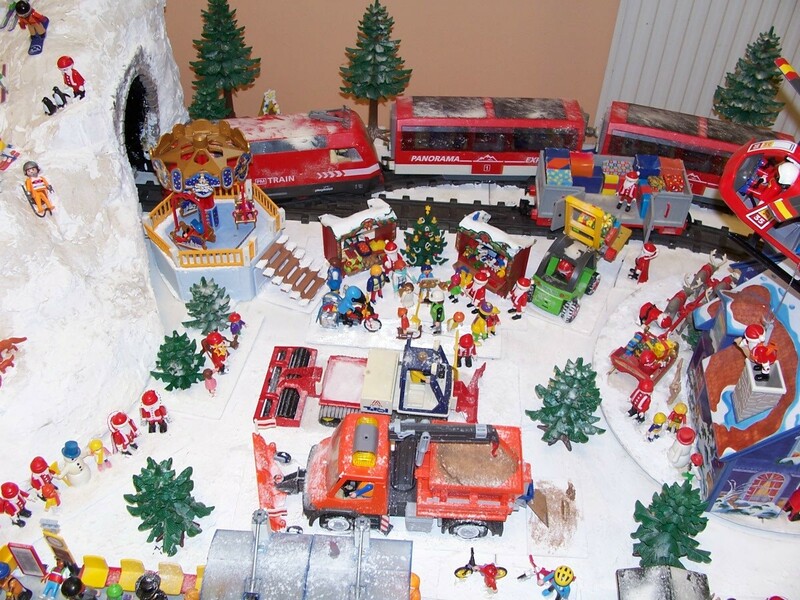 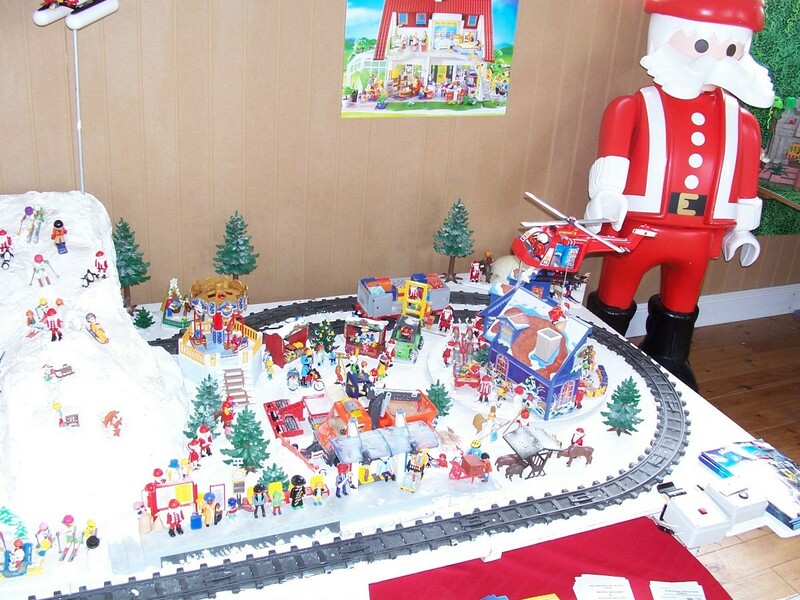 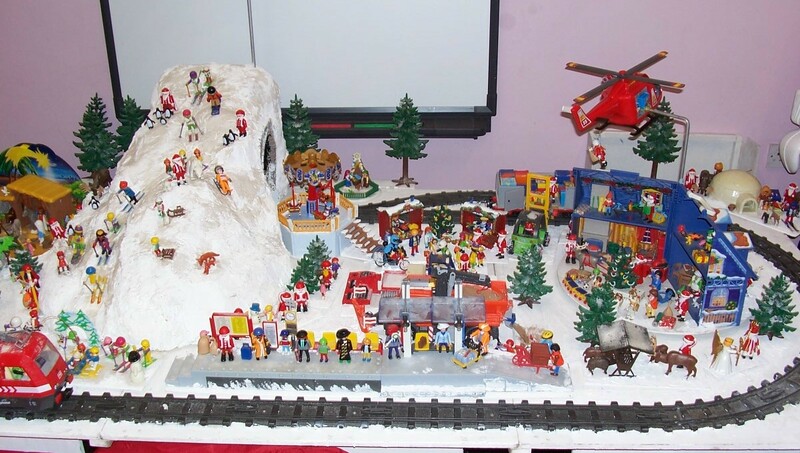 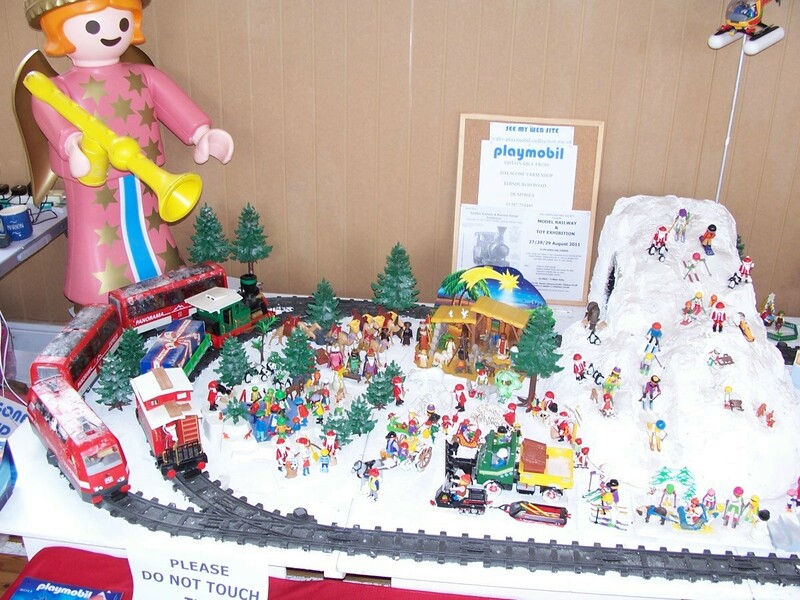 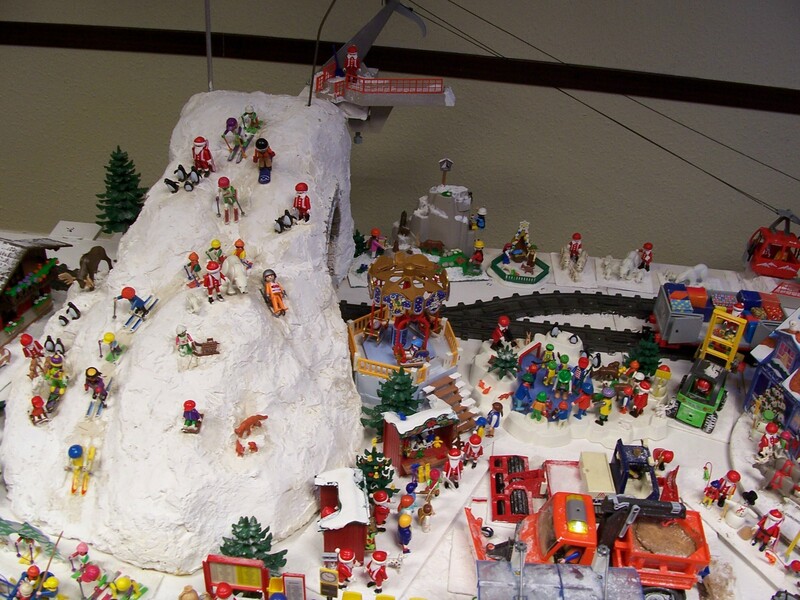 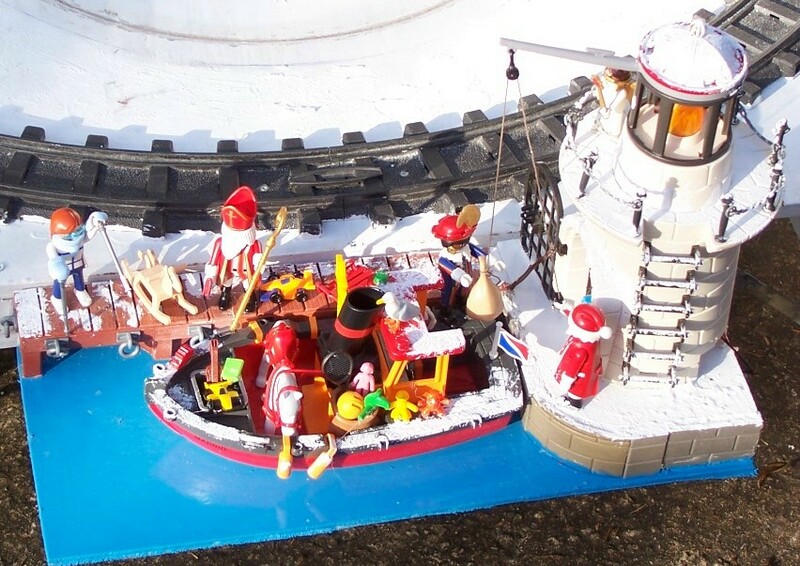 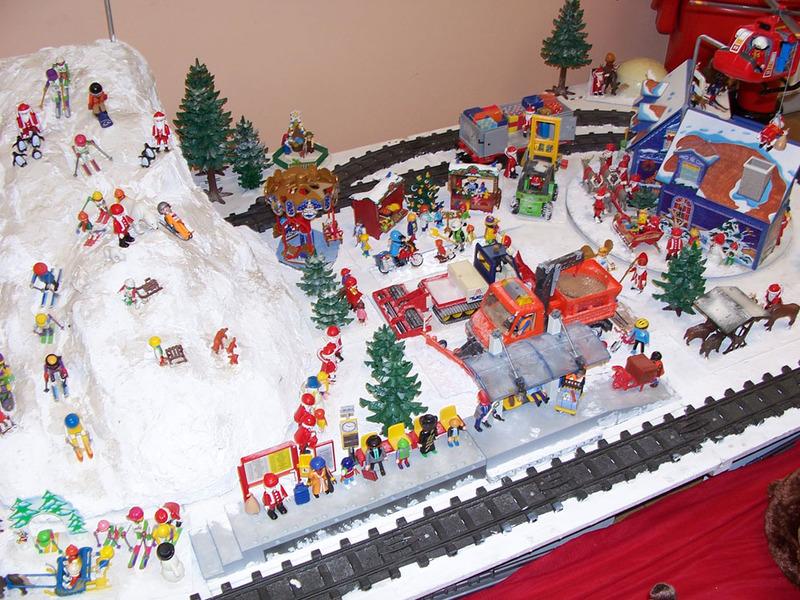 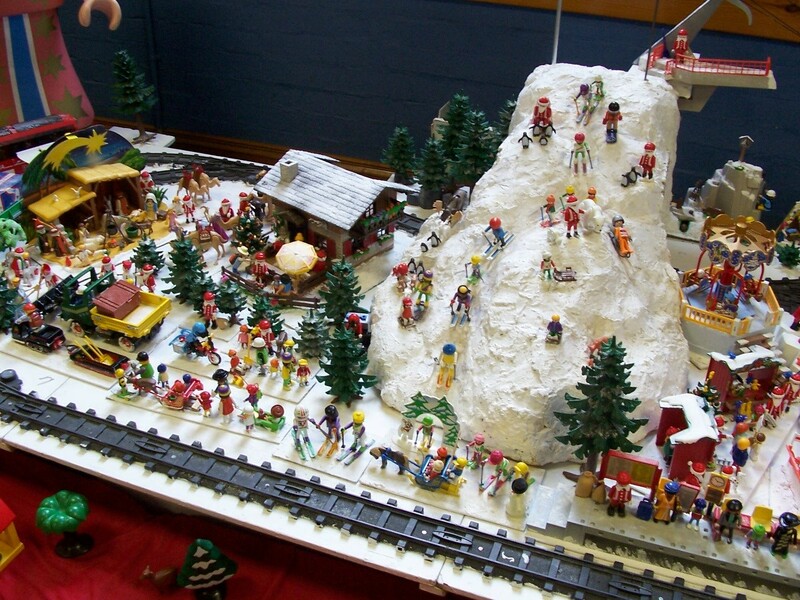 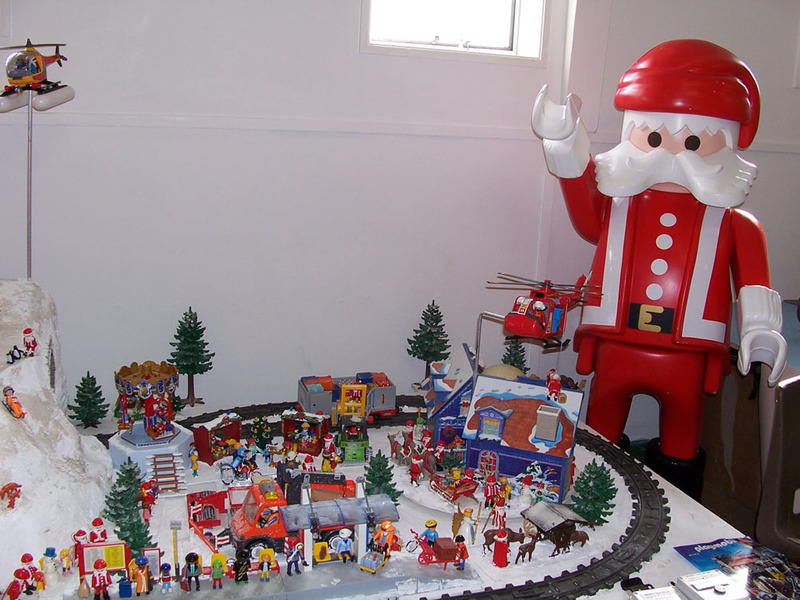 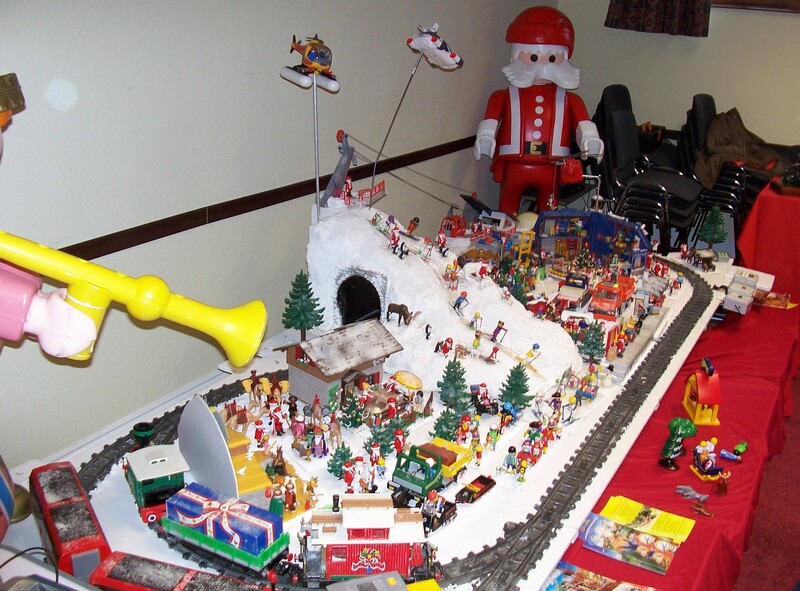 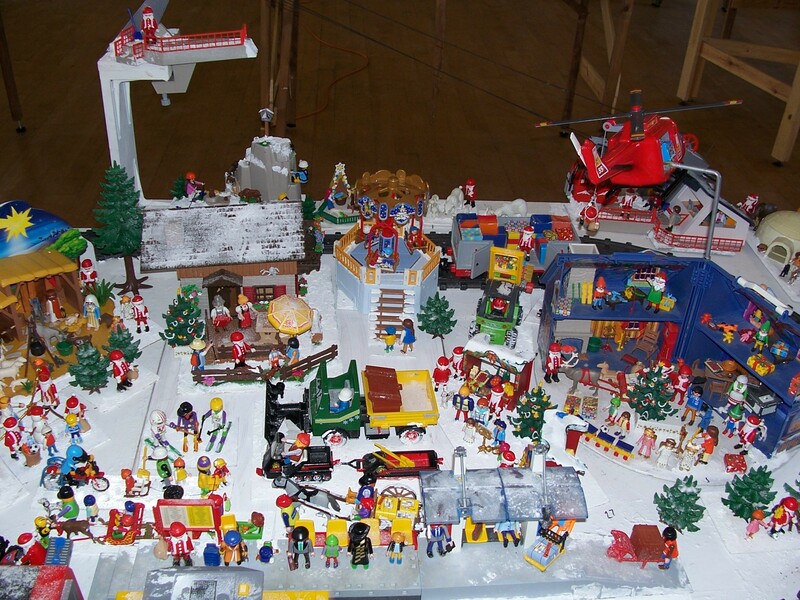 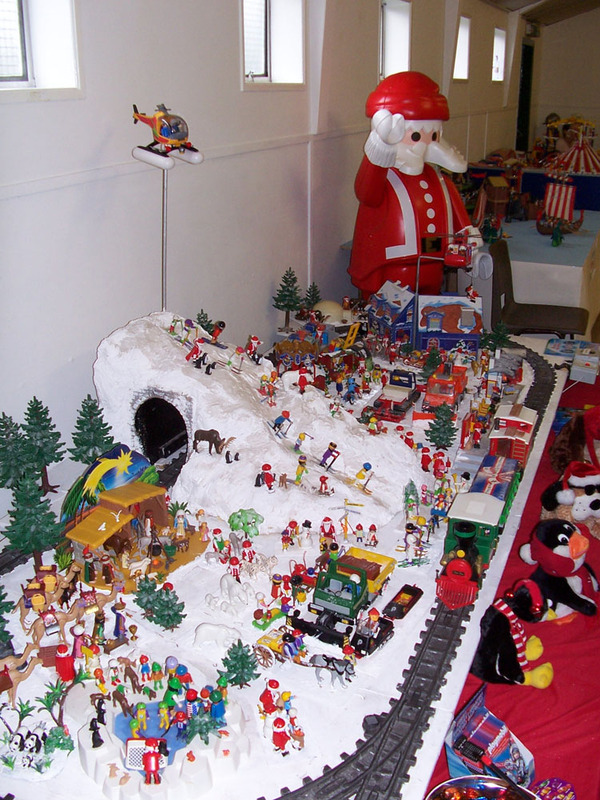 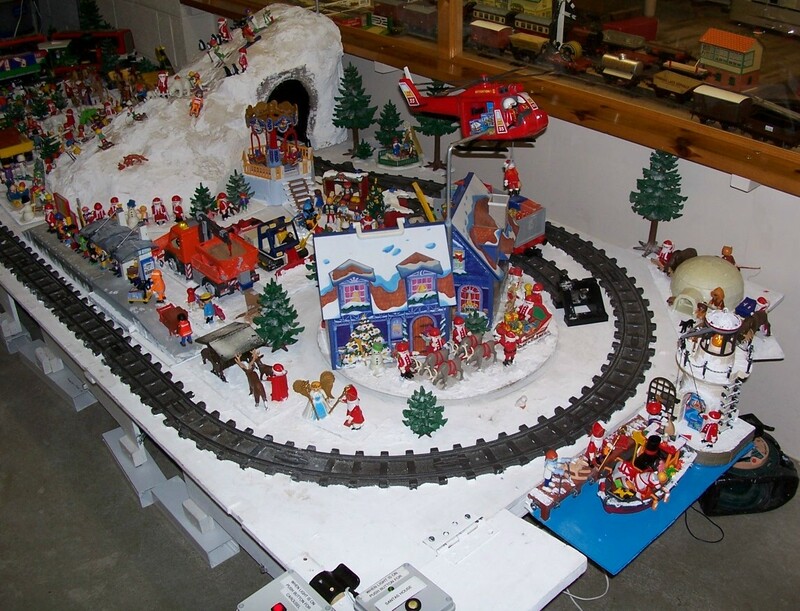 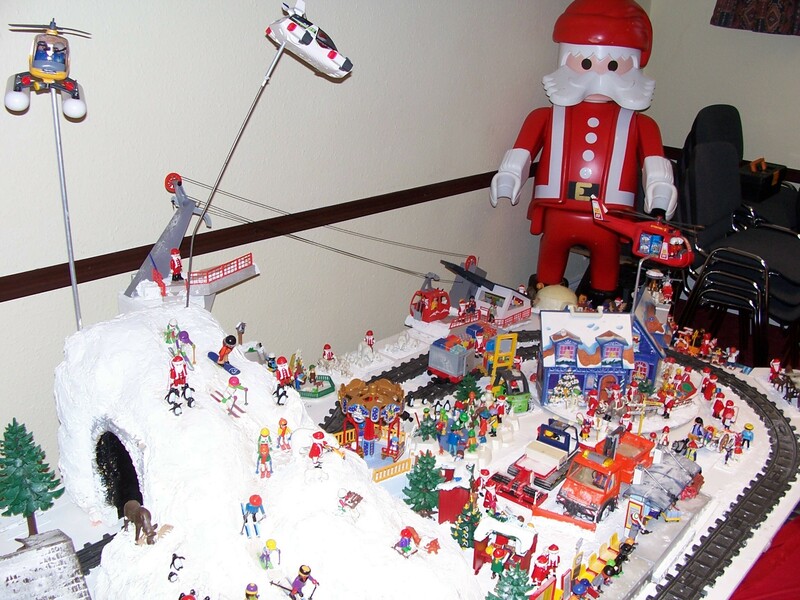 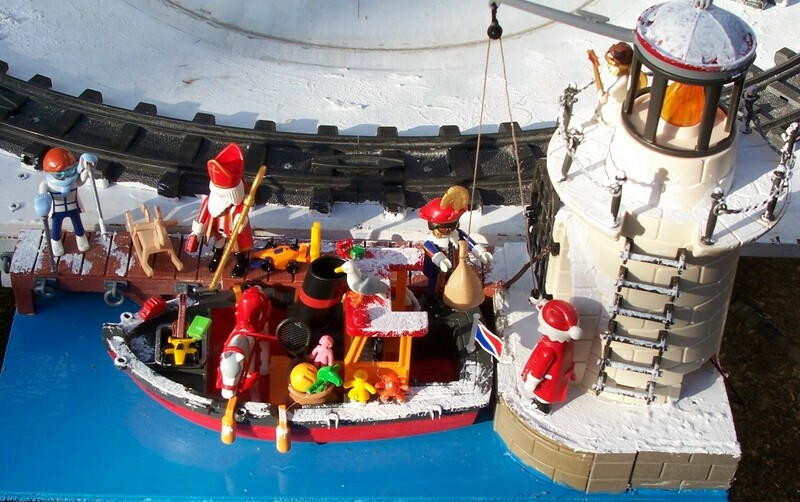 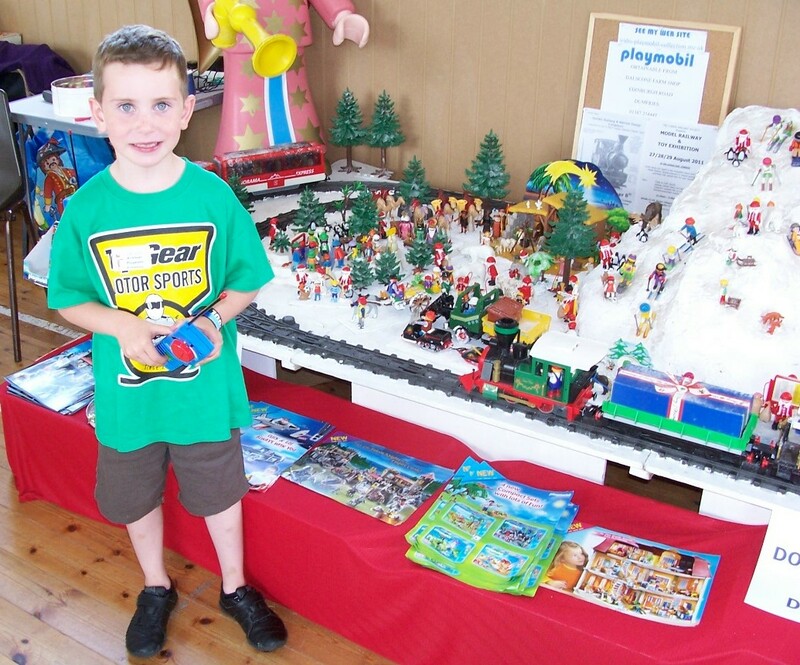 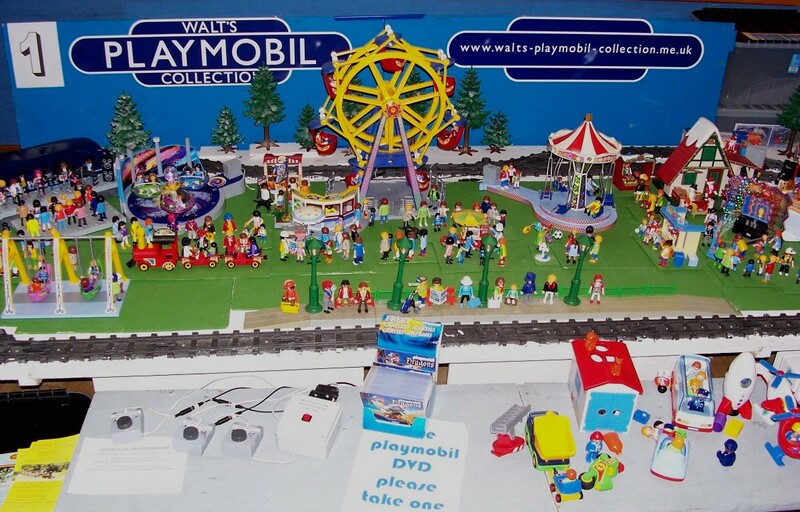 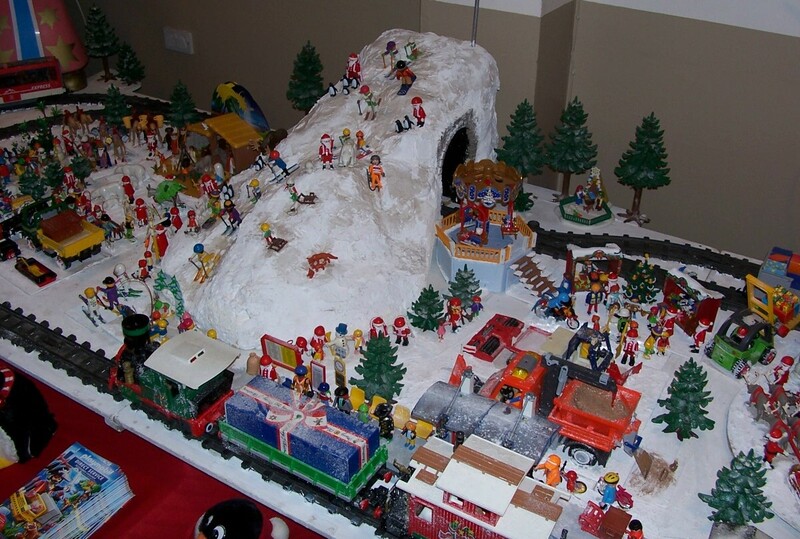 The layout depicts a winter scene near the Playmobil Father Christmas house. 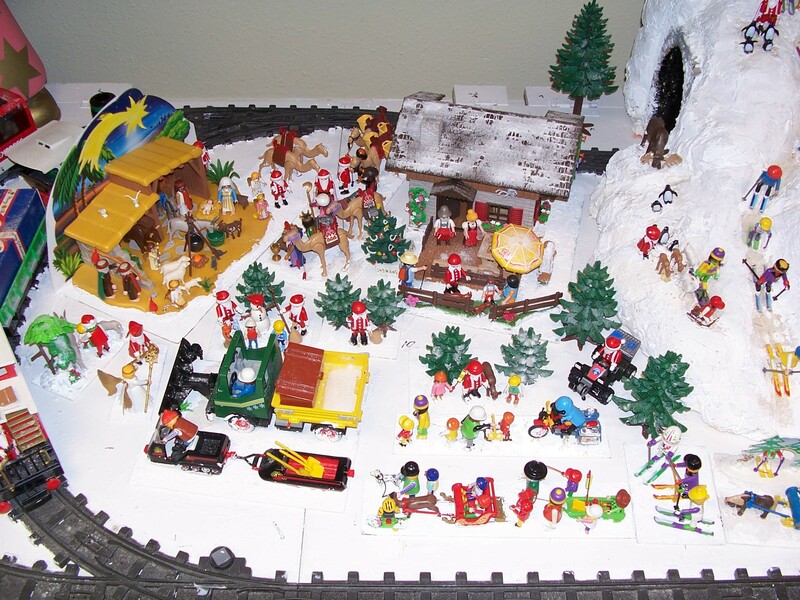 The siding of the main track is for Farther Christmas and is by his house. 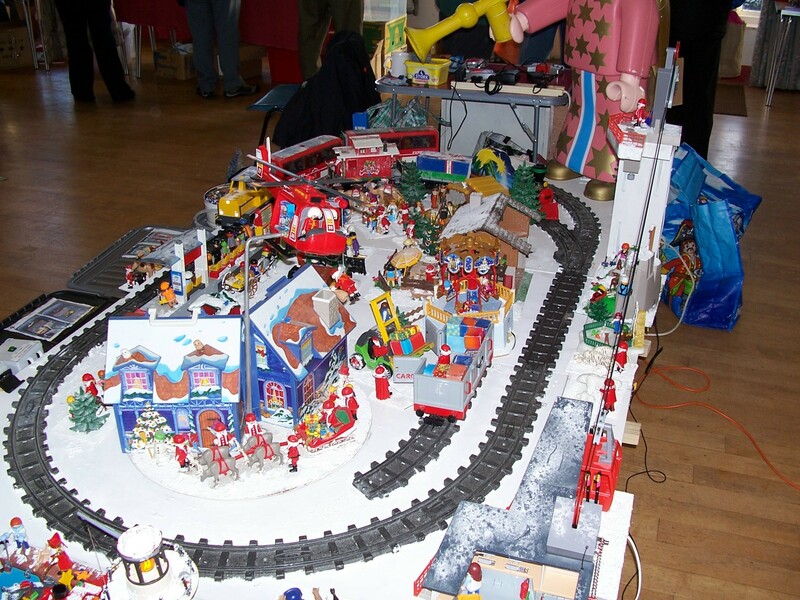 If a button is pushed the Farther Christmas House will rotate so that both the inside and the outside can be seen. 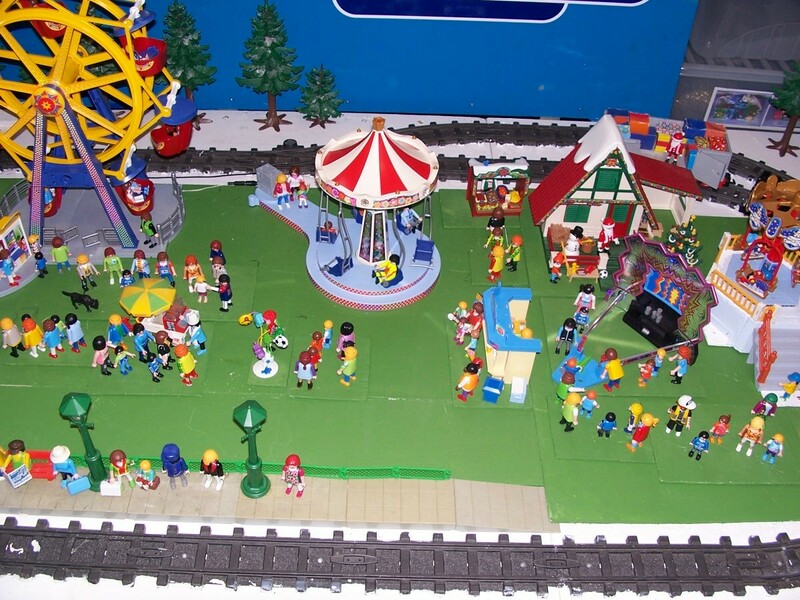 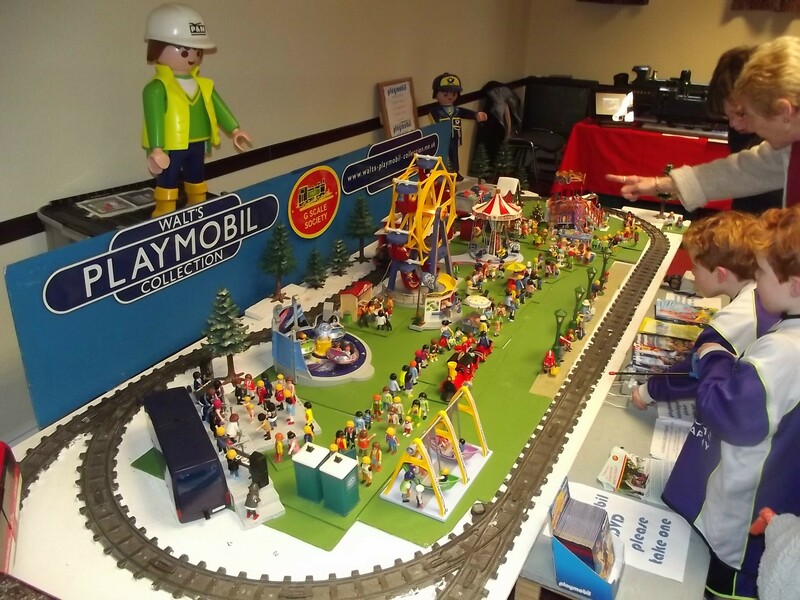 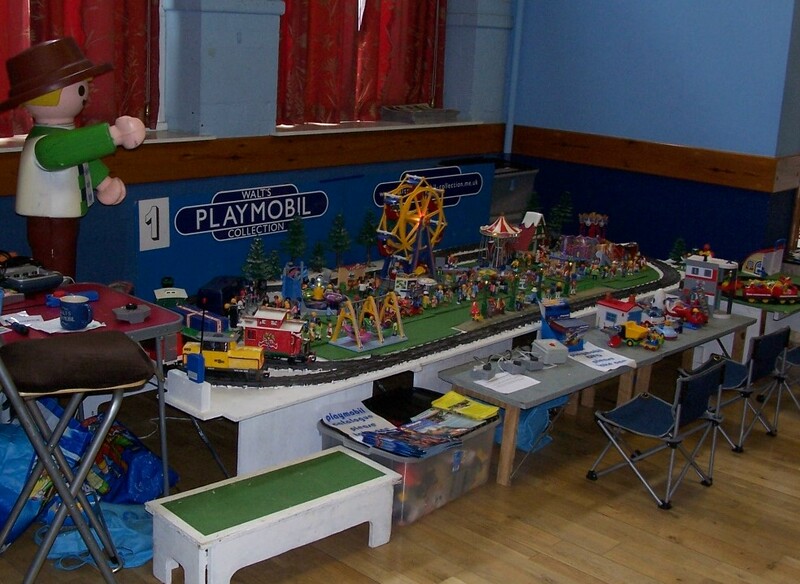 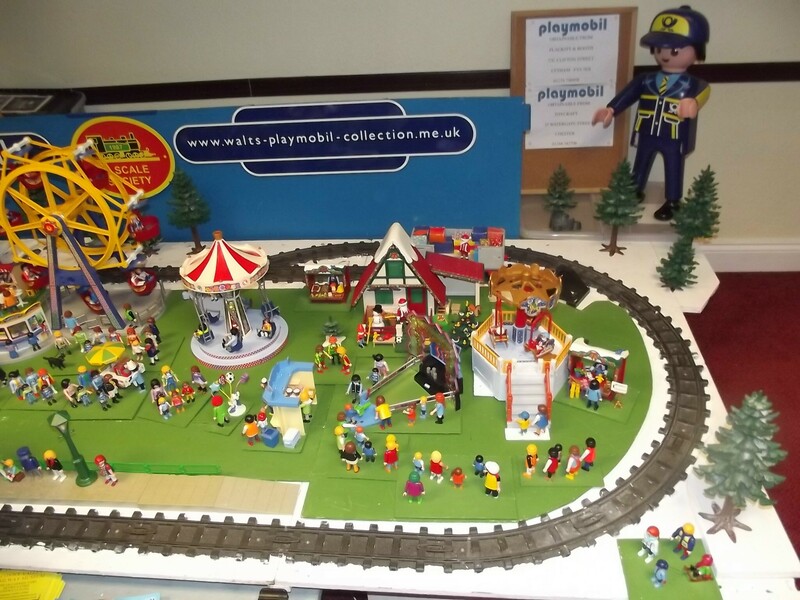 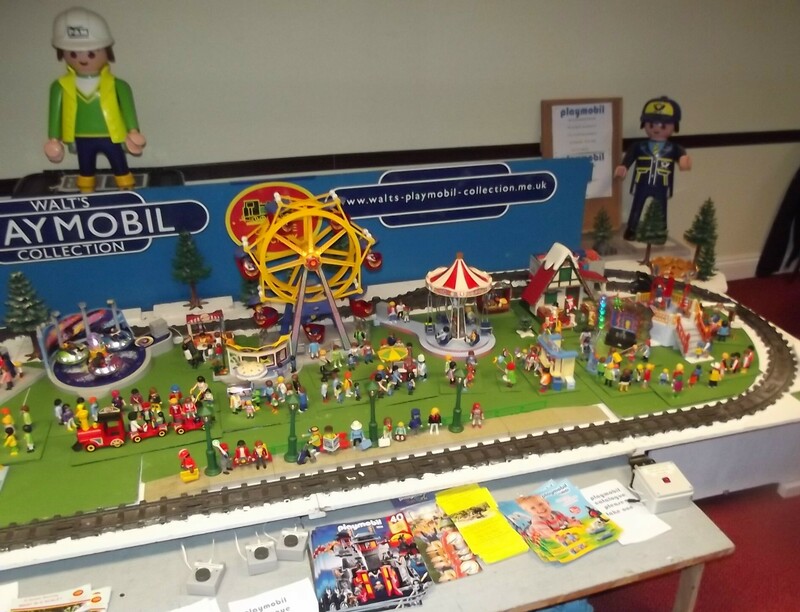 In the passing loop lines are the two Playmobil radio control trains that the children can drive round the layout. 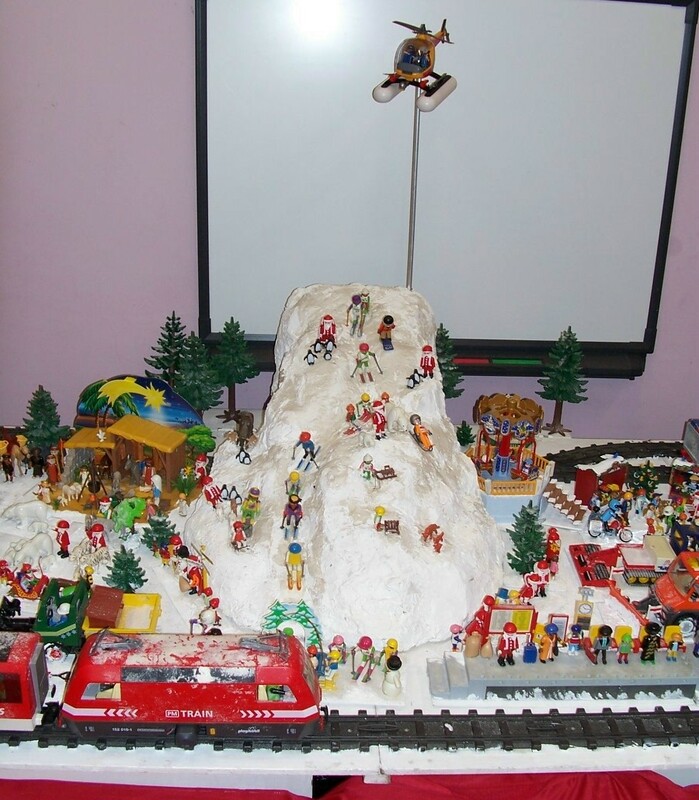 On the ski slope the Playmobil figures are enjoying themselves while on the road the snowplough is out moving the snow. 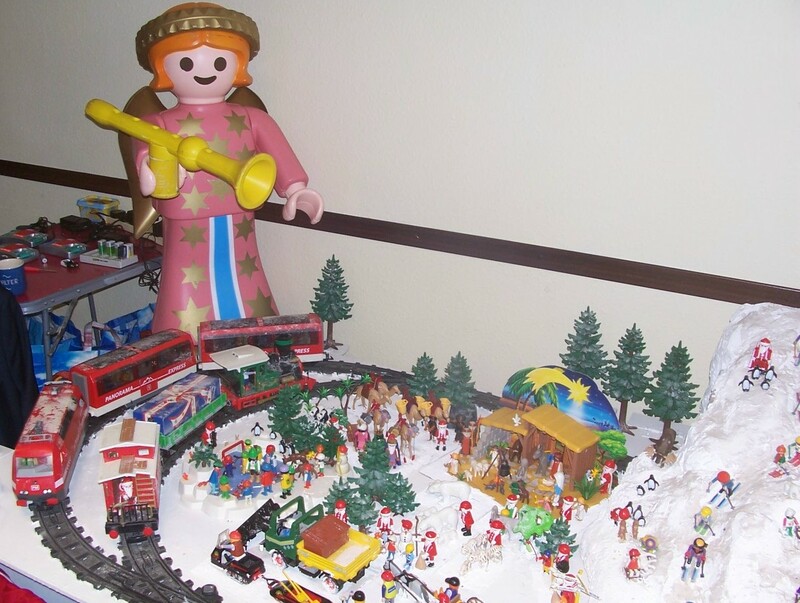 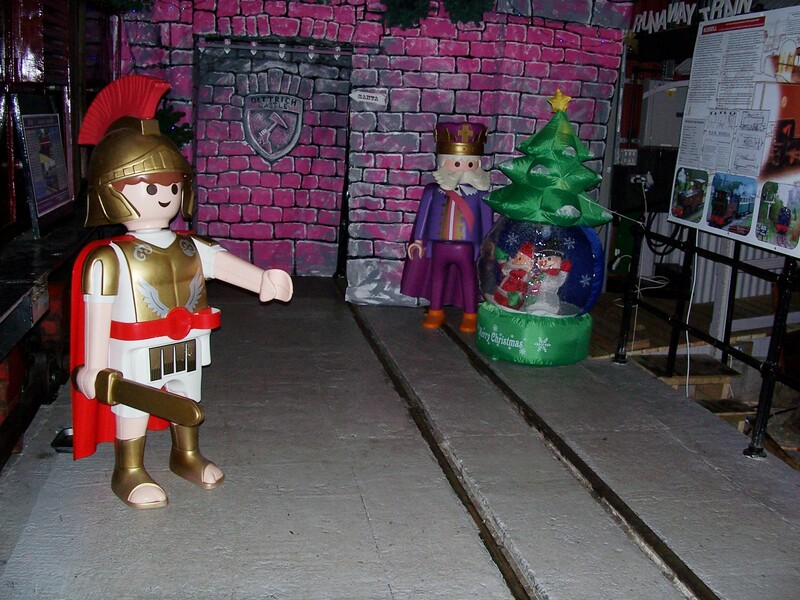 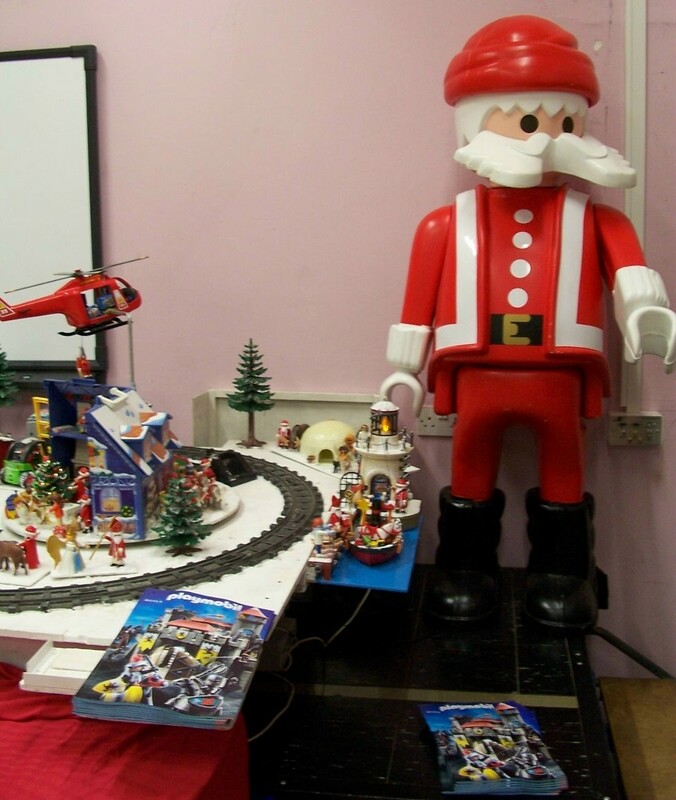 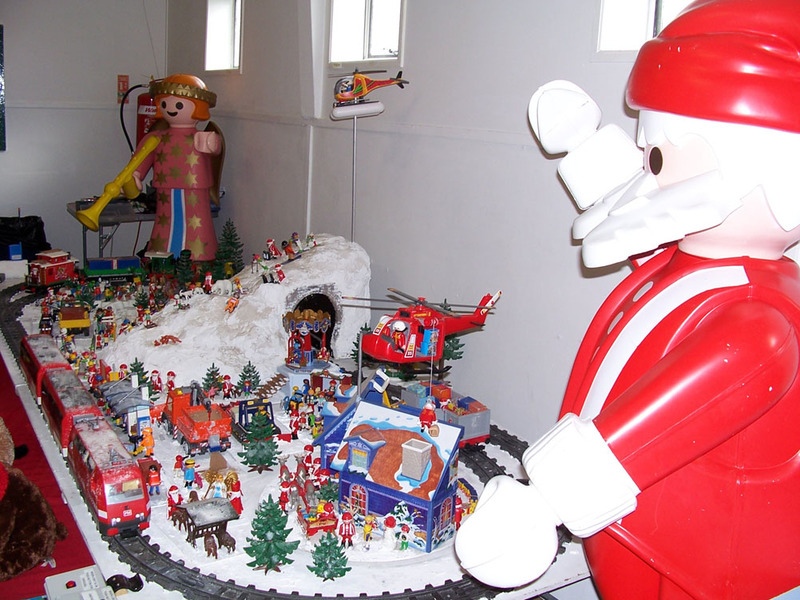 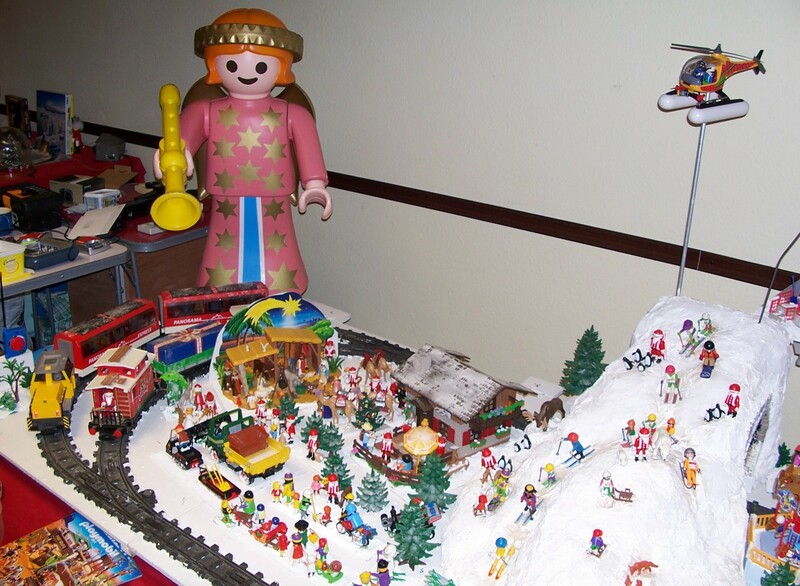 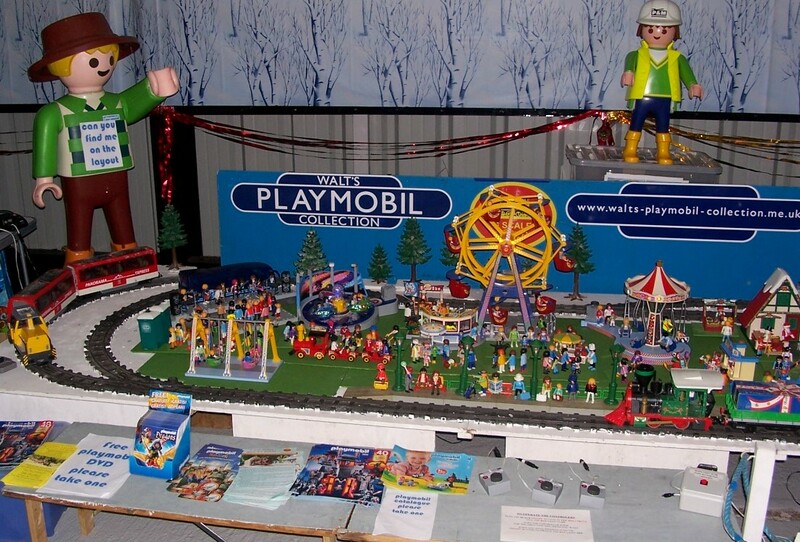 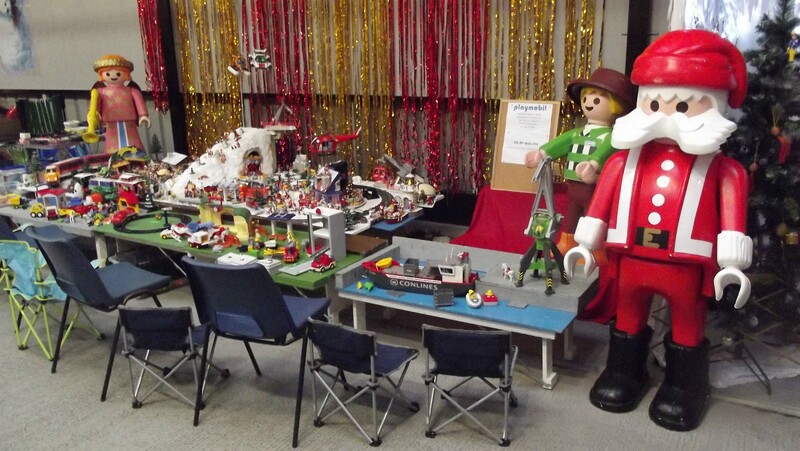 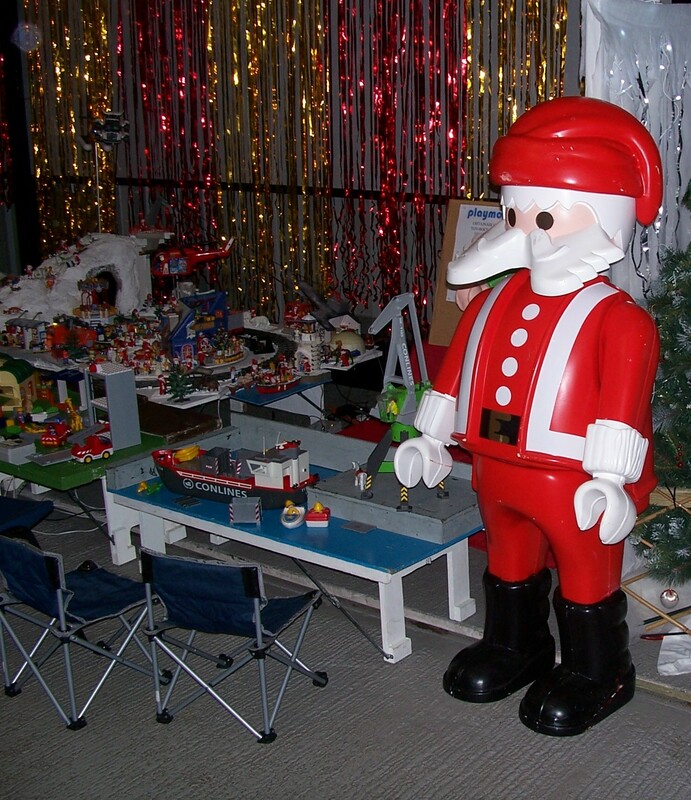 There are other scenes and all the figures are Playmobil that have to do with Christmas or wintertime. 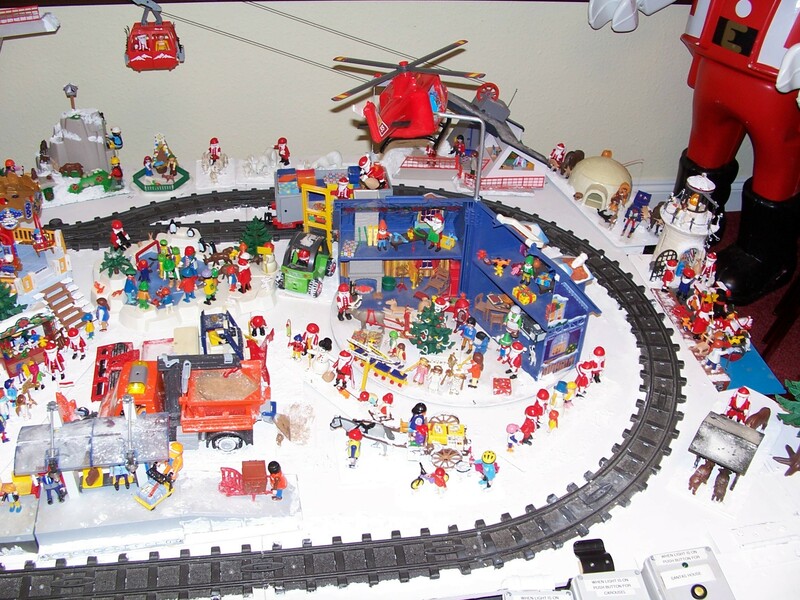 The children are asked to try and see if you can count the number of Playmobil Farther Christmas figures that are on the layout and then let me know. 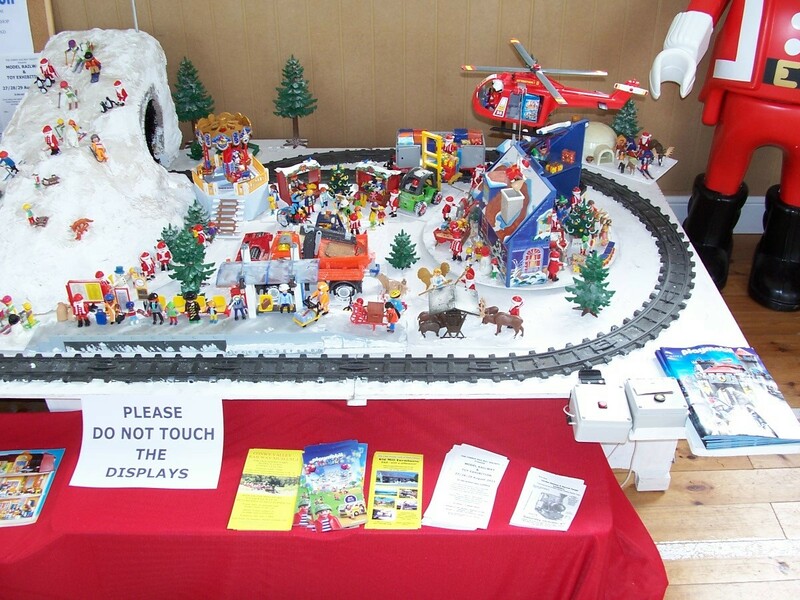 Due to the Christmas layout being small I have been asked to go to more exhibitions with it. 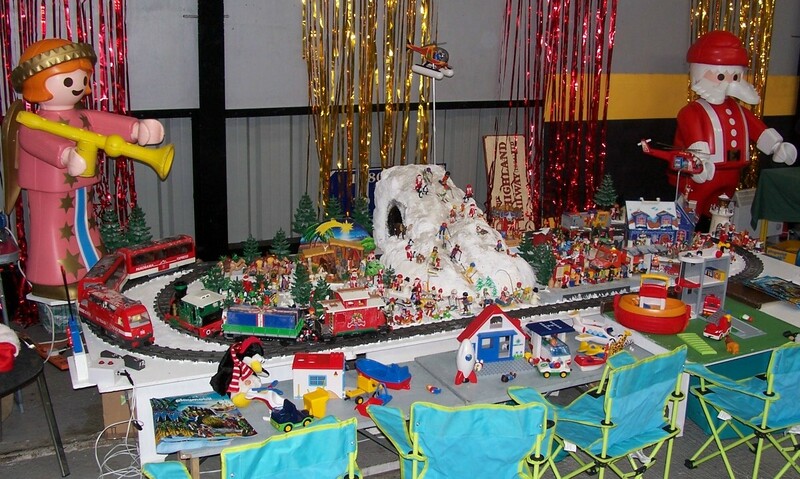 As time progressed I put some chairs in front of the layout and on them put some toy animals that would sing Christmas songs when a button on them was pushed. 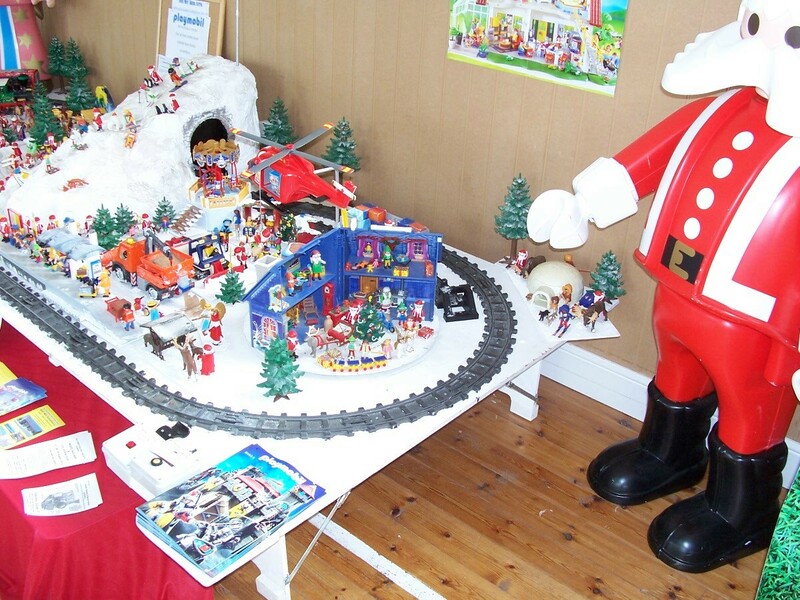 In the latter part of 2010 I acquired a full size Playmobil figure of Farther Christmas, also some of the new Playmobil Christmas sets. 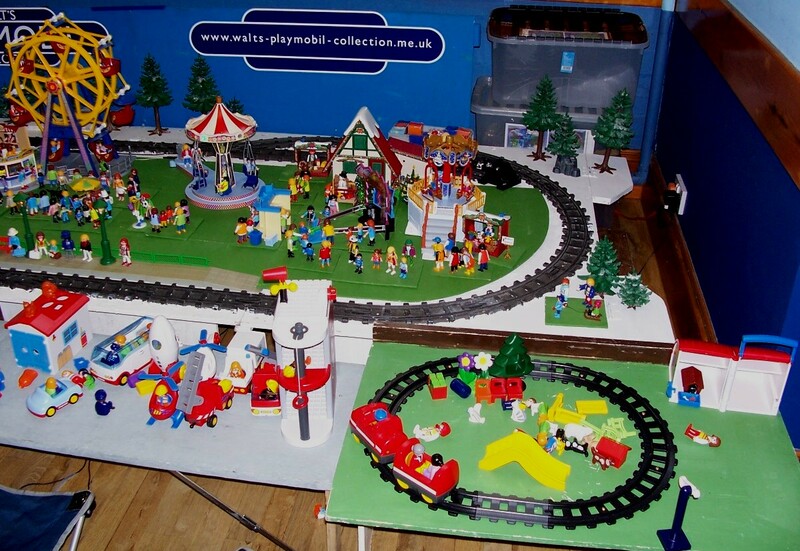 To make way for these the layout was rearranged. 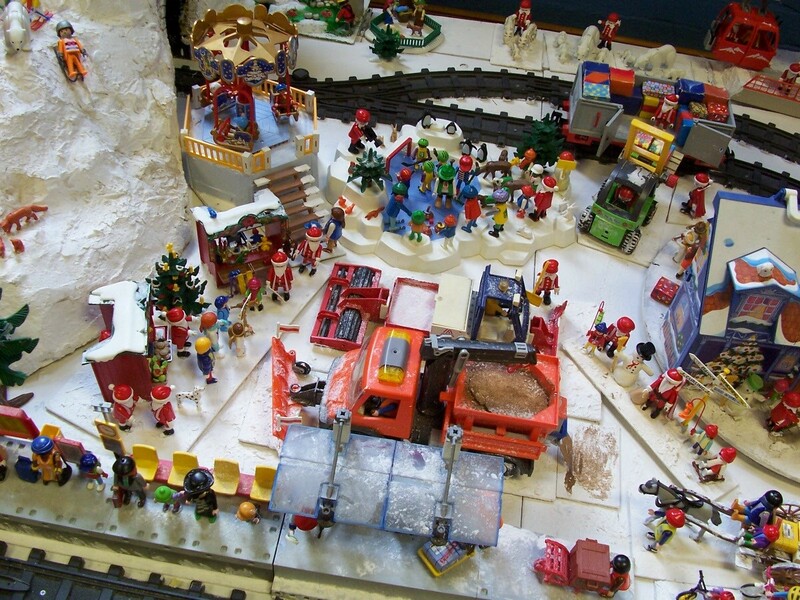 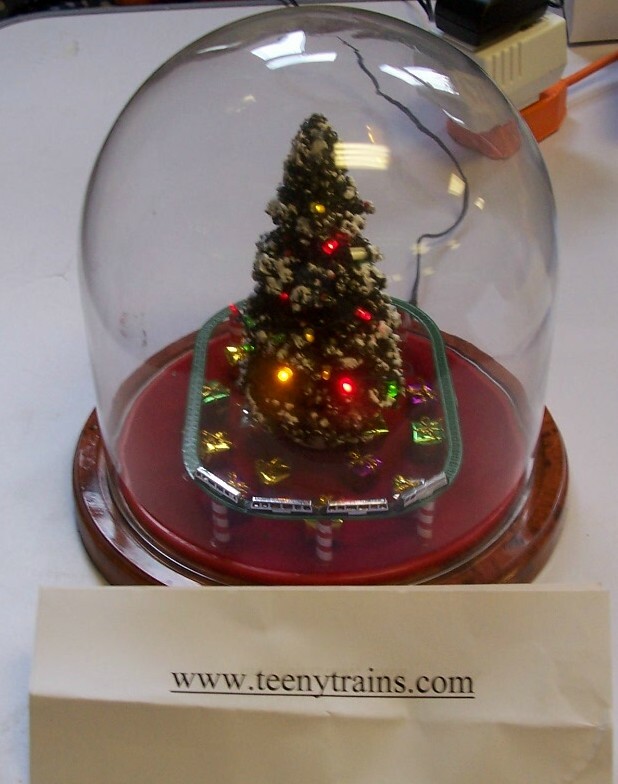 The farther Christmas was placed on the floor at the back right hand corner of the layout. 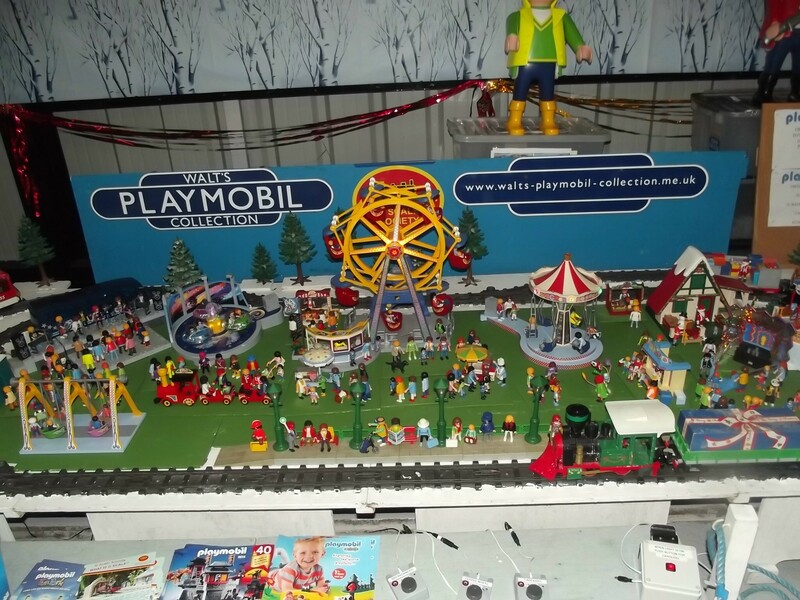 To accommodate the new sets some of the items that were not Playmobil have been removed. 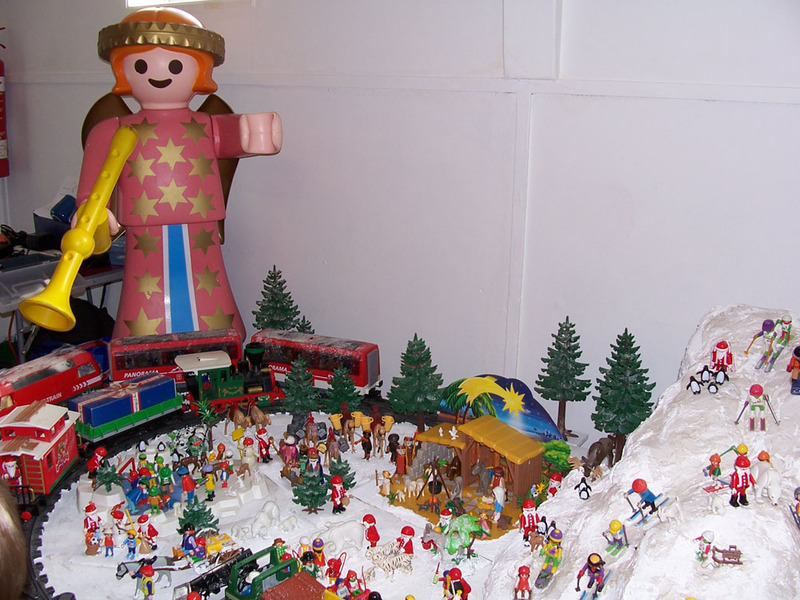 At the back right hand corner the Christmas tree with Farther Christmases on it was removed and replaced with the Igloo from the right of the hill. 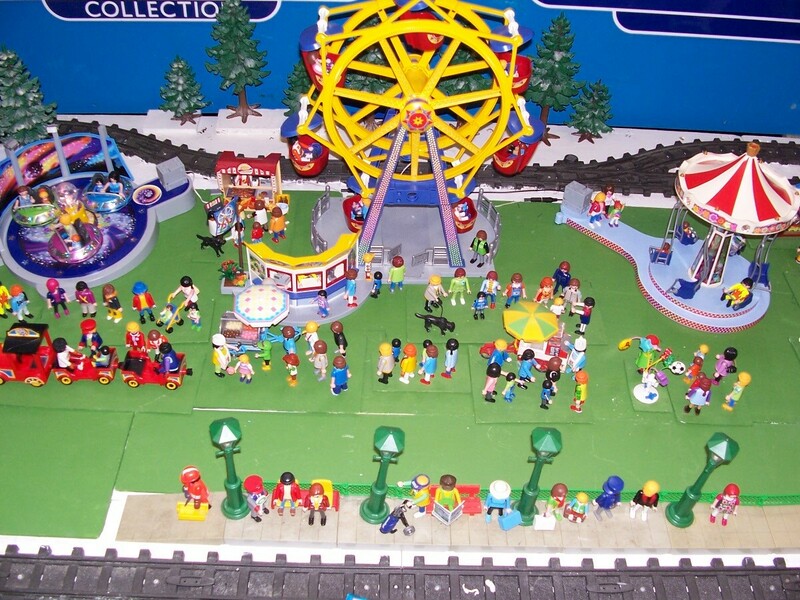 In place of the Igloo there is the Sled Carousel and the Christmas Market. 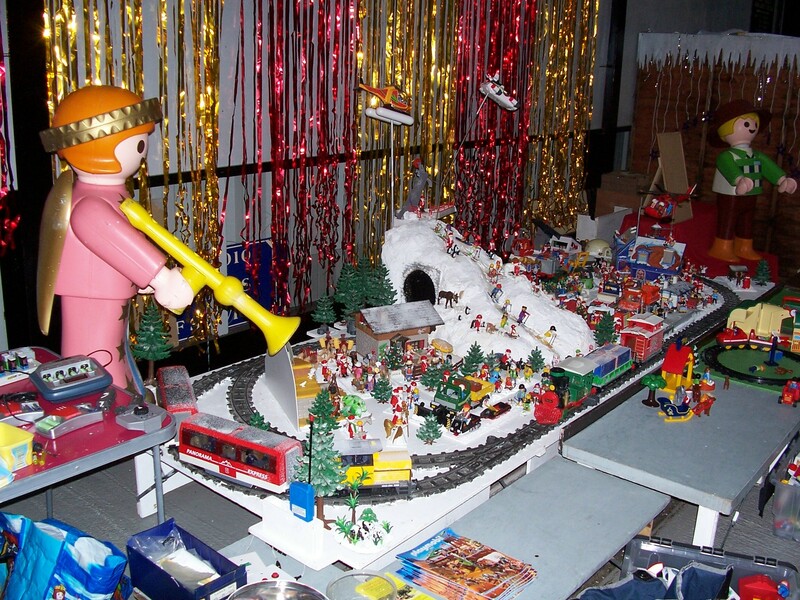 Behind these on the over side of the track the Snowman has been removed and replaced by the Nativity Scene and some Playmobil trees. 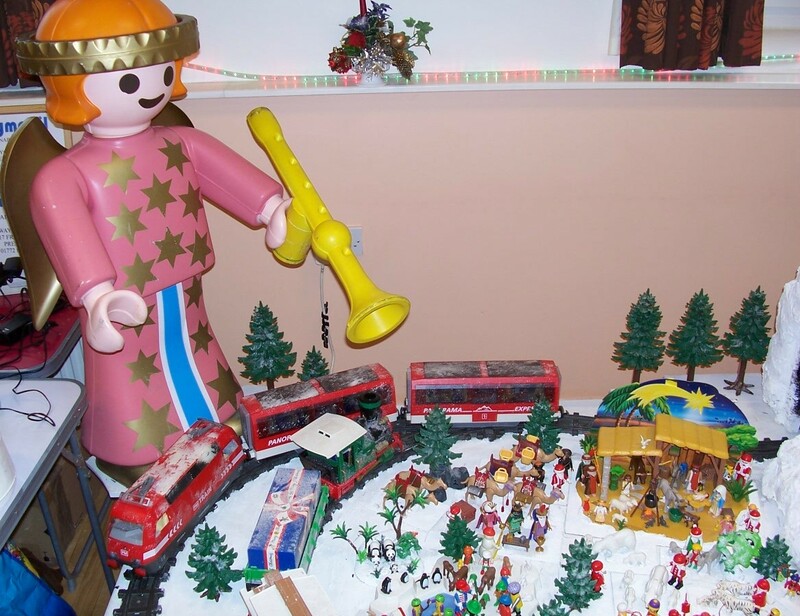 Near the front by the Christmas House has been put Saint Nicholas and the Angel. 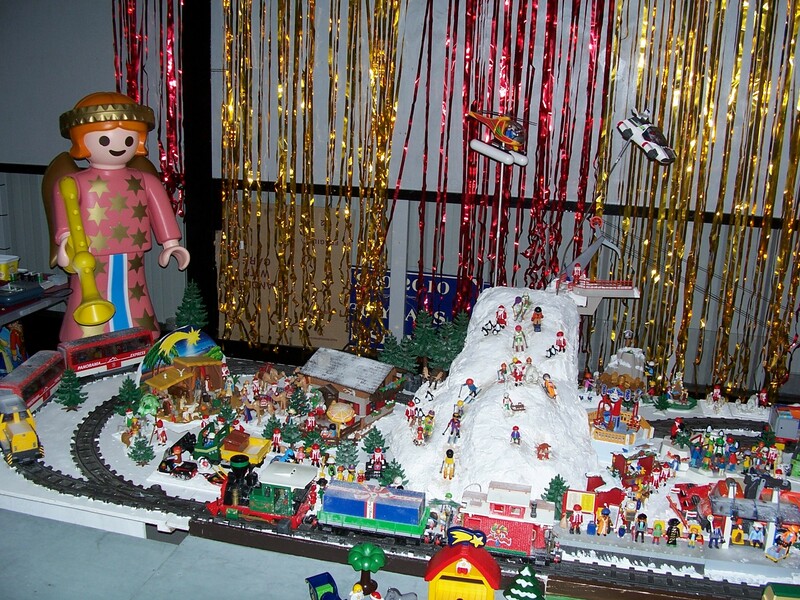 At the back to the left of the hill the Red Christmas tree has also been removed and replace with Playmobil trees. 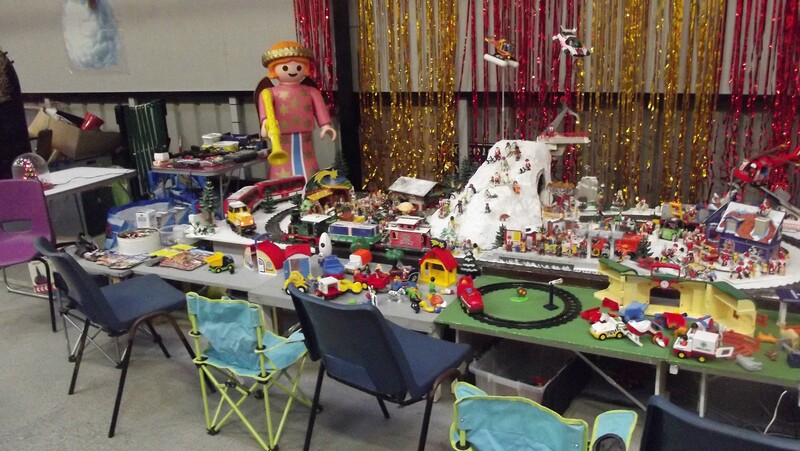 I also found that when the children pushed the buttons of the toys on the chairs they sometimes tended to push to chairs up to the layout so that the trains caught the chair backs. 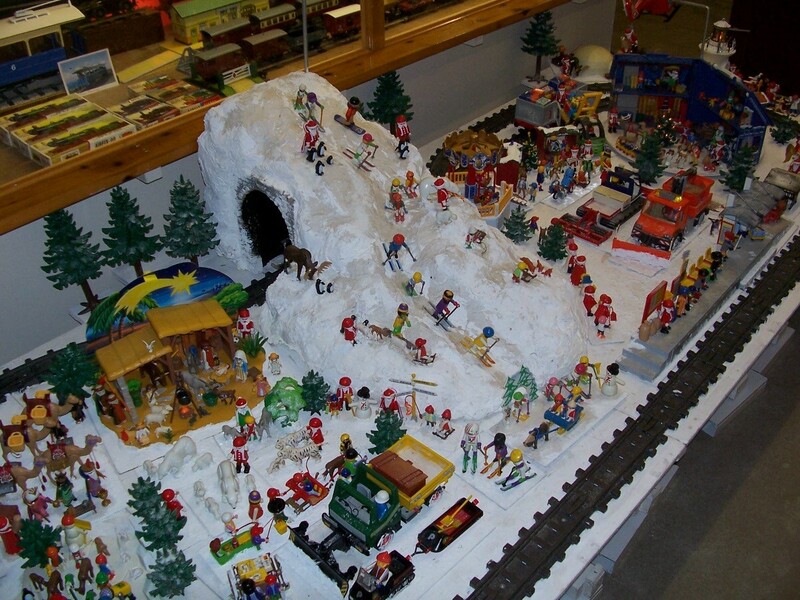 Instead I put boxes that I carried the dioramas in in front of the layout and covered it with a red cloth. 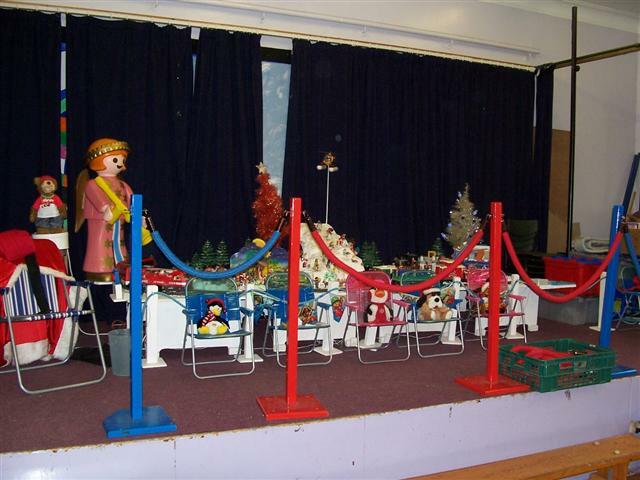 This meant I did not need to take the chairs with me. 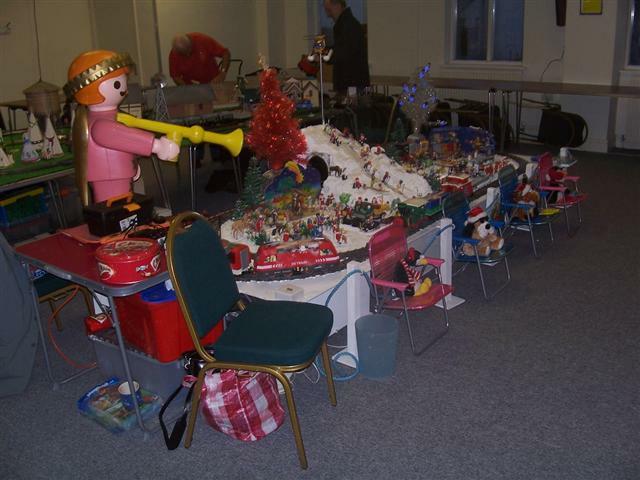 The results are shown in the photos below. 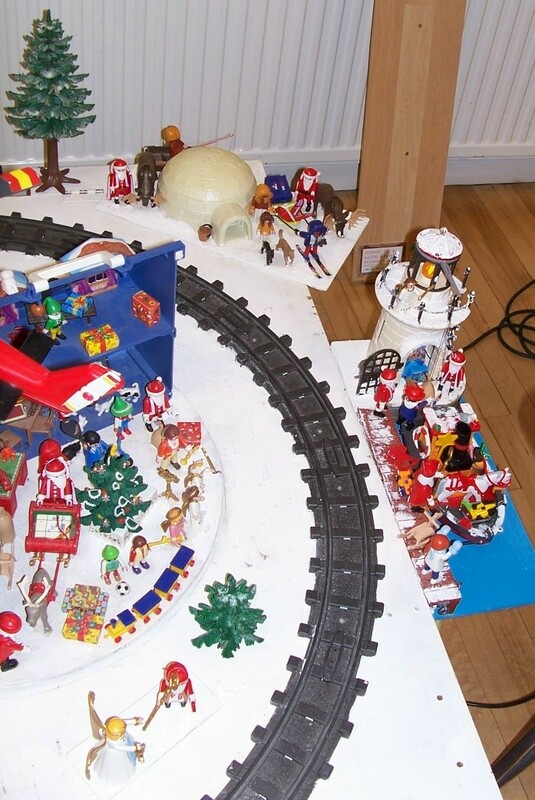 The Sled Carousel was fitted with a motor so that when a red button was pushed it went round for a short time. 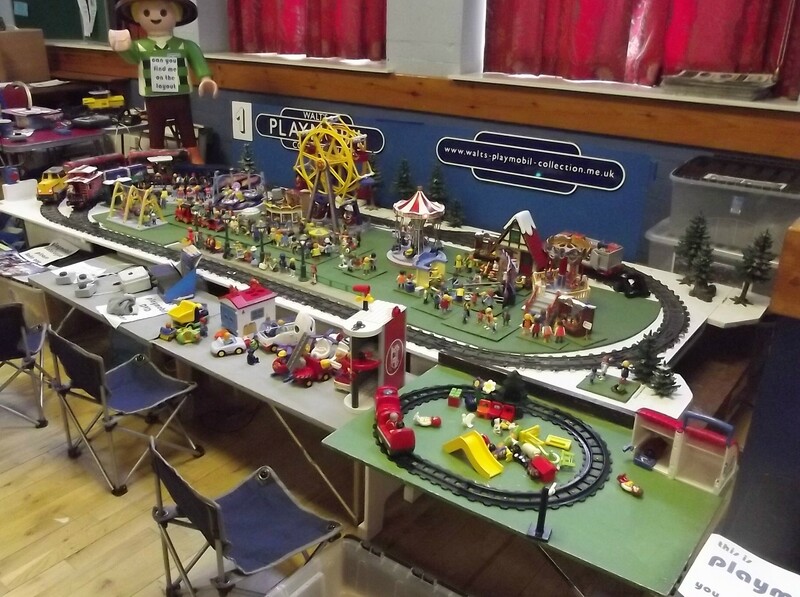 During summer 2013 the layout was modified to accommodate some of the items from the new Country range. 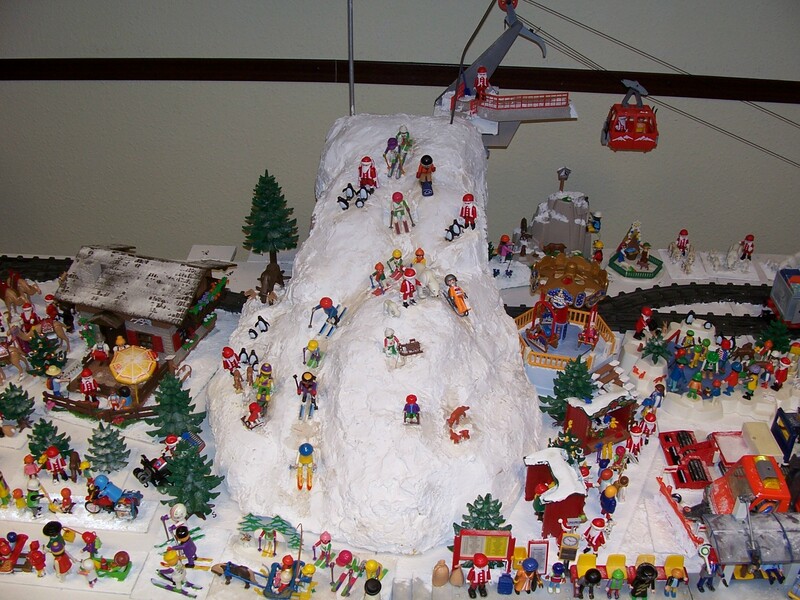 On the right hand side the Rock Climbing Mountain and the Cable Car are placed. 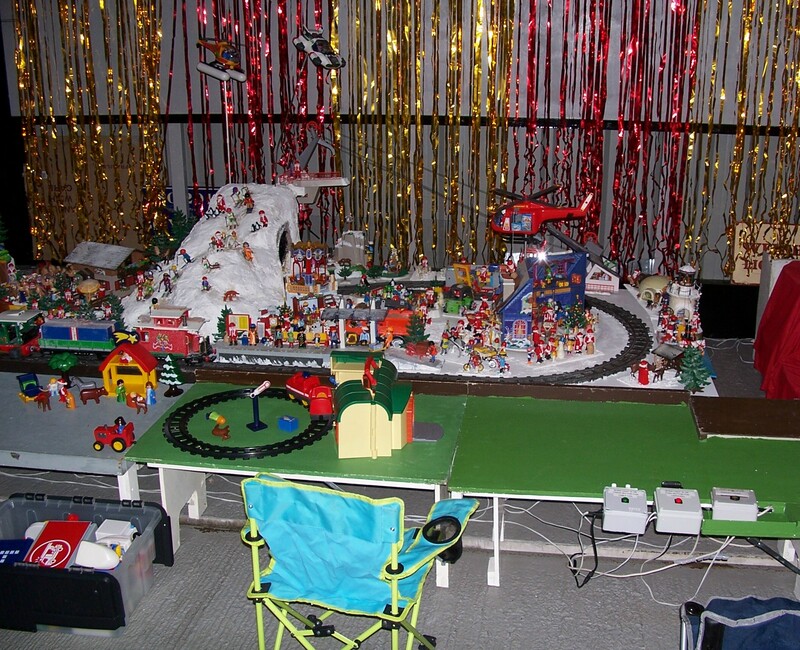 The Cable Car has had a motor fitted so that children can operate it by pushing a button.